June | 2016 | Mike Lamberti, From Margate To Cleveland, And Back ! 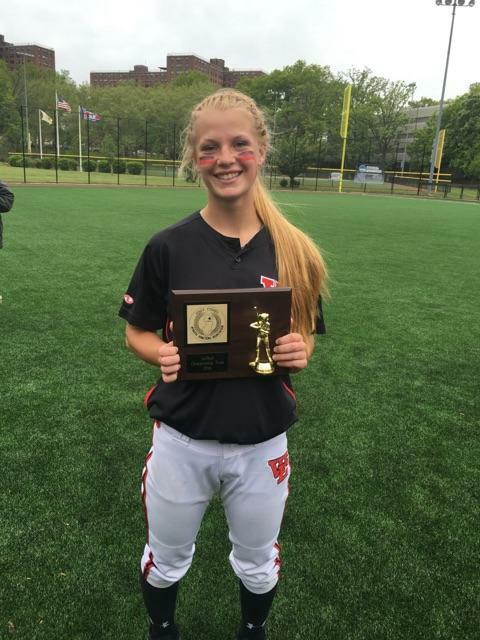 ESSEX COUNTY PLAYER OF THE YEAR: West Essex’s junior second baseman Bridget ‘Over Troubled Water‘ Betley put together a marvelous 2016 season, and is the choice here, as the Essex County Player of the Year. Betley hit .495 and drove in 38 runs for West Essex, which finished the season 26-3. Betley was also an effective pitcher, with a 4-0 record. 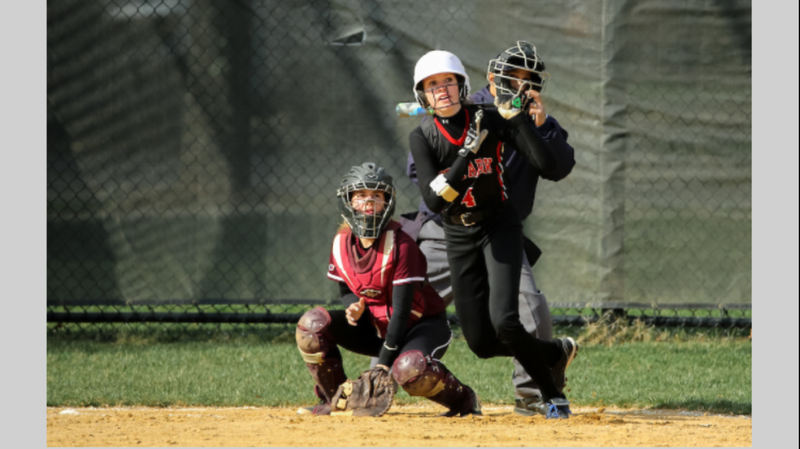 Betley’s tenacity at the plate and near-flawless play on defense were key to the Knights winning the Essex County Tournament and a state sectional championship, as well as claiming a share of the elite Super Essex Conference’s American Division title. She was also her biggest critic, often downplaying her performance following a game. But that hard work and determination certainly paid off. Betley was particularly dominant in the Essex County Tournament championship game, finishing 2-for-4, with three runs scored, three RBI, a huge triple and a stolen base, as the Knights brought home its first county title in nine years. 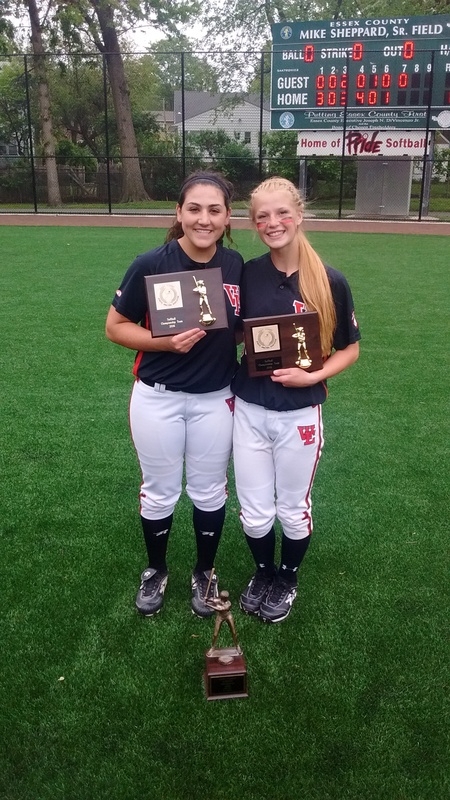 ESSEX COUNTY PITCHERS OF THE YEAR: Kelsey Oh of Mount St. Dominic and West Essex’s Sami Huetter, both juniors, were incredible this season. Oh, now a two-time Gatorade Player of the Year, was dominant once again for the Lions, who had a very good season in 2016, finishing 26-4. And while Oh was American Pharoah-like in the circle, she’s also a force at the plate. The sky appears to be the limit for Oh in 2017. She’s already won two Essex County championships, three straight Super Essex Conference titles and a state championship. Since Oh’s arrival in 2014, Mount St. Dominic is 84-10. Her numbers as a pitcher are incredible. This year, she had over a 2 to 1 strikeout to innings pitched ratio and an ERA that’s almost half of what Bob Gibson put up in 1968. 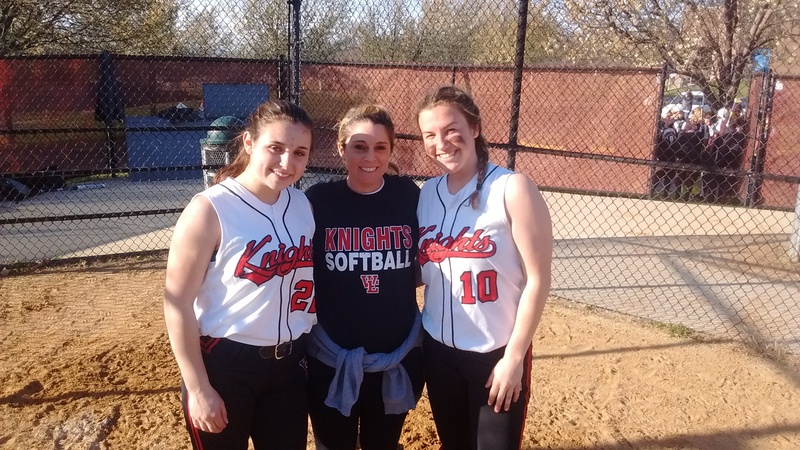 Huetter (Canonero II) continued her stud-like effort in leading West Essex to its first Essex County Tournament crown in nine years, as well as the program’s first state sectional title in six years, as the Knights finished 26-3. Huetter was 18-3, with a 1.10 ERA. 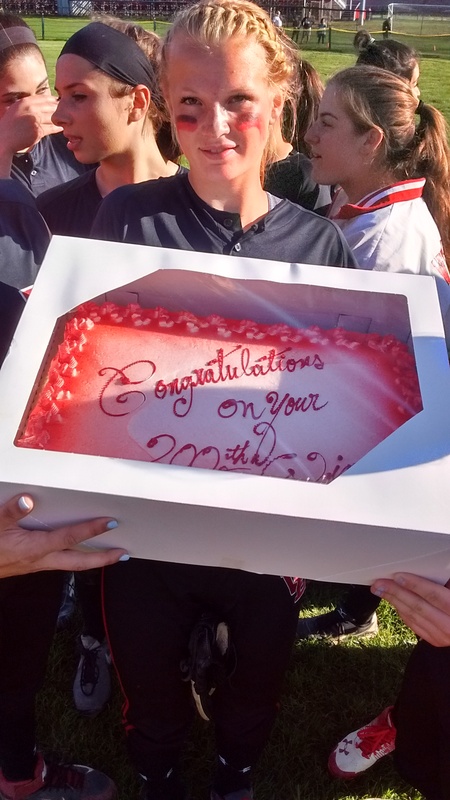 In 147 innings, she struck out 143 batters, while giving up just 23 earned runs. At the plate, she had a breakout season, hitting .369 with 11 RBI, four doubles, a triple, a homer and a .508 slugging percentage. As good as she was in 2016, Huetter never got away from the first premise of playing, which was having fun. Her infectious personality and boundless energy made her a natural-born leader of a team made up mostly of her classmates in a loaded junior class. She avenged both her conference losses with dominant efforts. 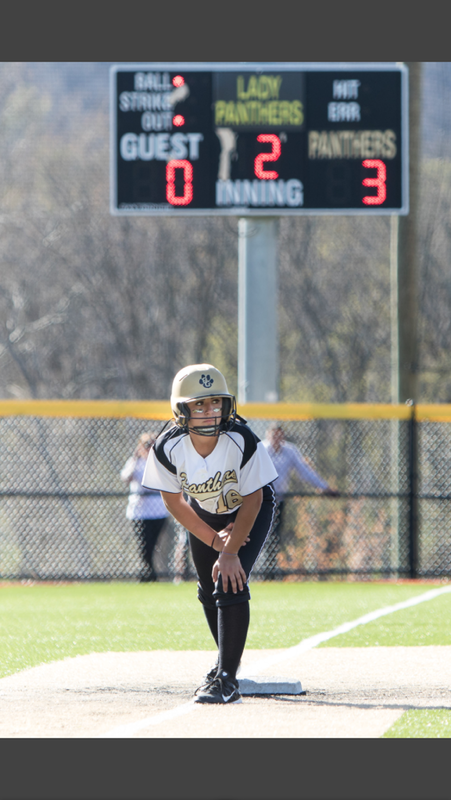 After falling to Mount St. Dominic, 6-4, Canonero came back to defeat the Mount for the first time in her career, 5-1. Following a 3-2 setback to Montclair, Huetter was masterful in beating the Mounties, 11-3, in the Essex County final. 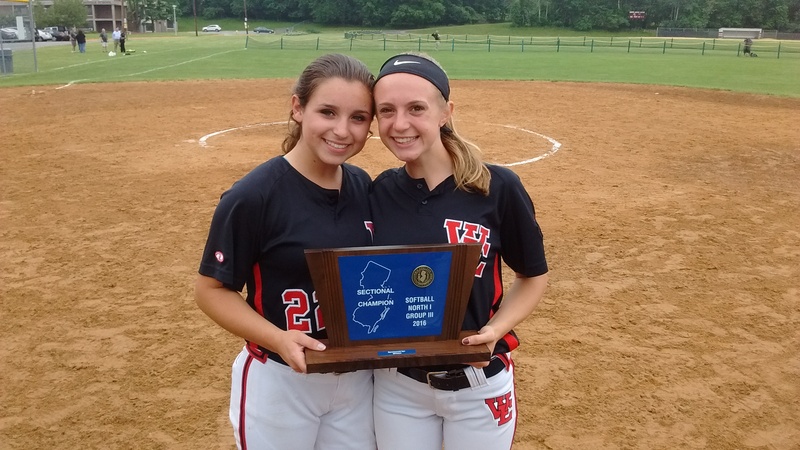 Sami Huetter and Bridget Betley of West Essex. SEC PITCHERS OF THE YEAR: While none of the current crop of players won’t know what 1968 means when it comes to great pitching, this season could be called The Year of the Pitcher, in Essex County, similar to what ’68 was in Major League Baseball. 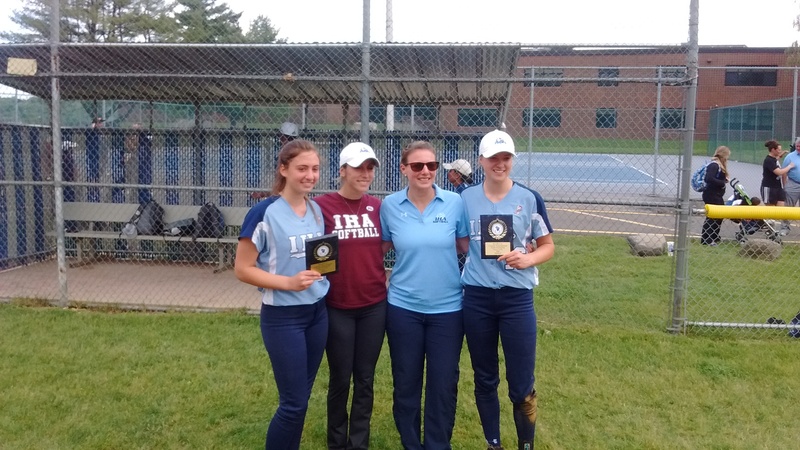 There was some great pitching this season in the SEC, as Nutley’s Emily Holden, Jessie Masur of Montclair and Sydney McCormack of Livingston were brilliant in 2016. 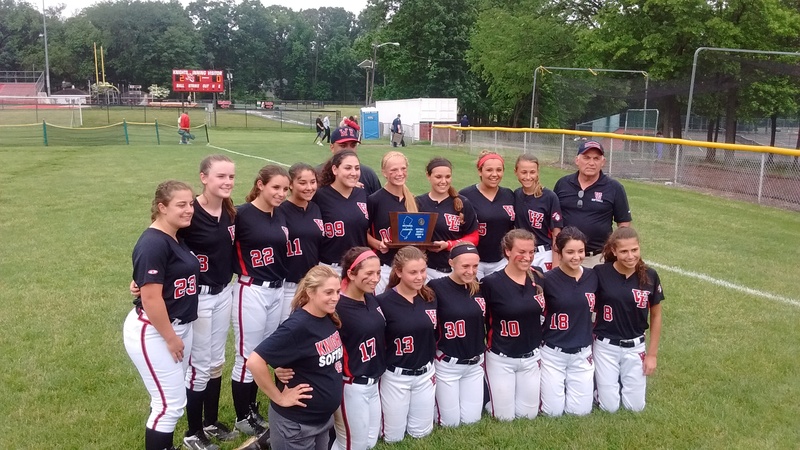 Montclair’s run to a county final in 2016 was led, in part, by pitcher Jessie Masur, bottom row, third from left, with one of Ed Bates’ pals. Holden, a real work ‘horse’ (pardon the pun) was Nutley’s best player this season, guiding the Raiders to a 23-7 record. As a pitcher, Genuine Risk was 22-7, with 295 strikeouts in 193 innings of work. She yielded just 42 walks and spun three no-hitters. 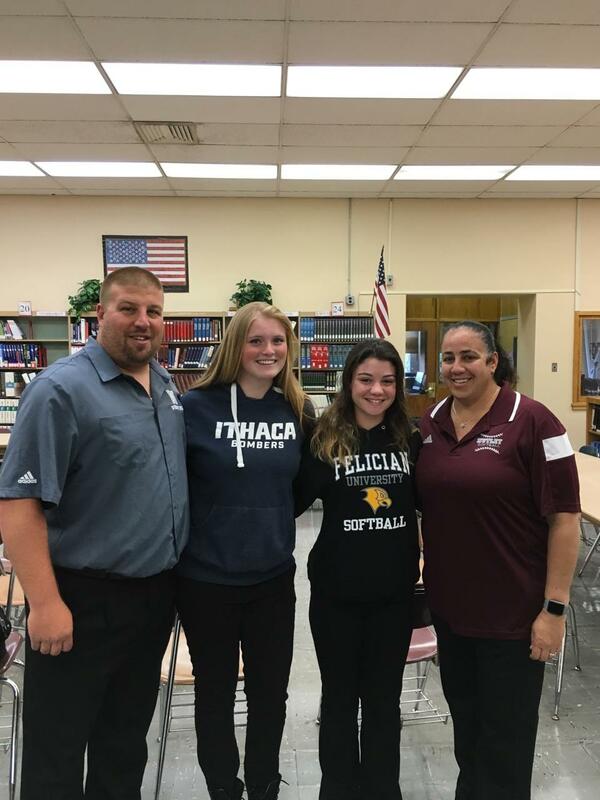 Headed to Ithaca College, where she will pursue a degree in Physical Therapy, Holden, as nice a kid as you’ll ever meet, was dominant at the plate, too, hitting .369 with 18 RBI and 32 hits. Emily Holden, with coach Luann Zullo. Holden will attend Ithaca College this fall and plans to continue playing softball. 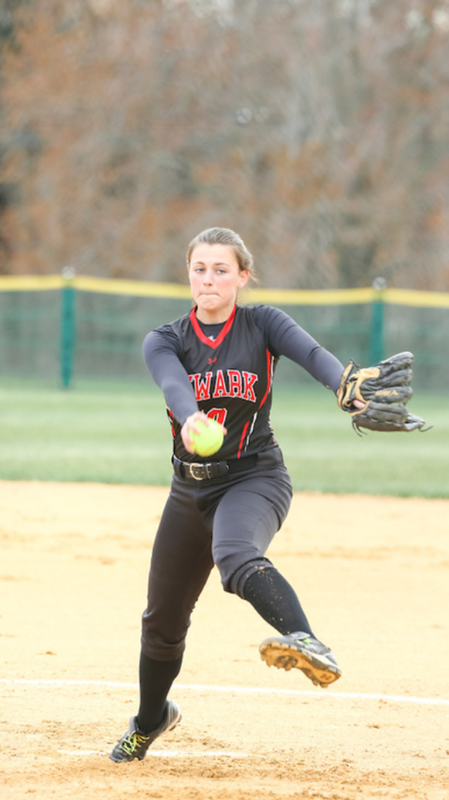 Masur, a junior, led Montclair to the Essex County Tournament championship game and pitched some wildly entertaining games this season, including a 20-strikeout game, in 10 innings, over Bloomfield, and a nine-inning, 4-3 win over Mount St. Dominic in the quarterfinals of the ECT. Montclair struggled in the early going, but the Mounties went on a 7-game winning streak over the second half of the season, paced by some marvelous efforts from the player Montclair coach Phil Delgado called ‘Maddux’, comparing Masur to the Hall of Fame pitcher, Greg Maddux, who had legendary control around the plate. 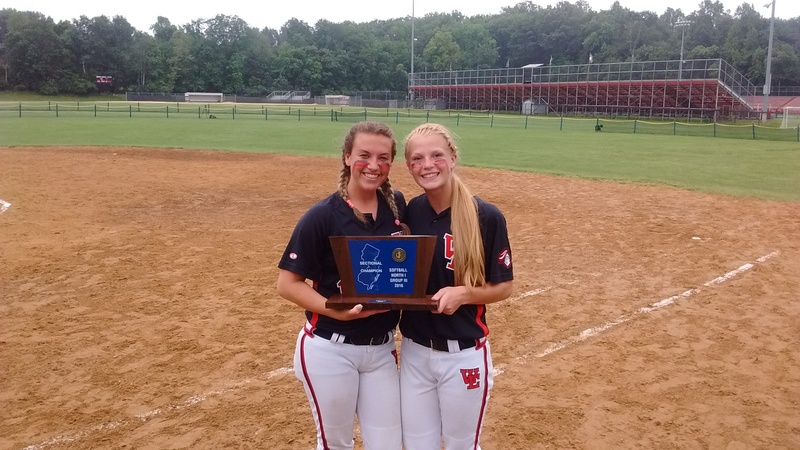 McCormack (Syd The Kid) saved her best in the circle for the NJSIAA Tournament and helped the Lancers win the North Jersey, Section 1, Group 4 title for a third time in the last five seasons. 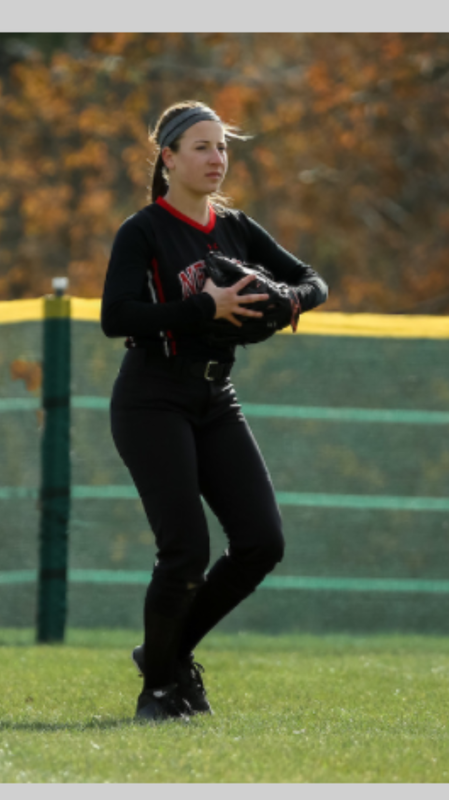 She was also outstanding in the Group 4 semifinal, holding a hard-hitting team from Watching Hills, which eventually won the Group 4 title, to a one earned run, as Livingston played well, but dropped a 2-1 decision. McCormack will attend Penn State University this fall. She was a pleasure to watch play. 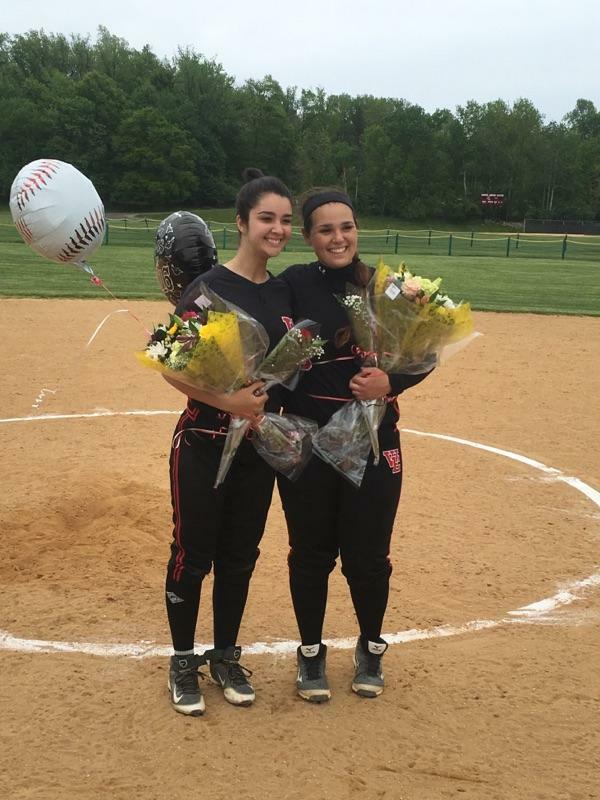 SEC PLAYERS OF THE YEAR: Erica Robles of Montclair and Cedar Grove’s Rianna Marinelli led their respective teams to outstanding seasons. Montclair and Cedar Grove both have young nucleus’s and will be among the teams to watch in 2017. Robles, a senior this season, helped her teammates learn how to win. 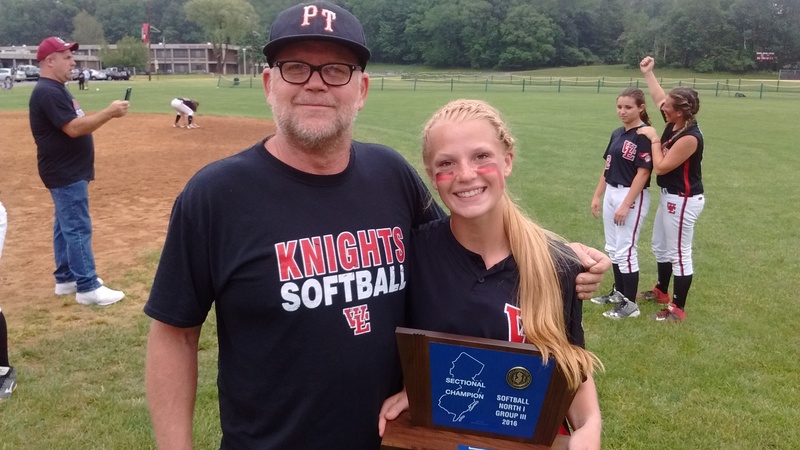 She was a tremendous third baseman, a dangerous power hitter, clutch relief pitcher, and, like so many of the kids who played softball in Essex County, an even better young lady off the field, with her class and leadership skills that will define a successful life in college, and beyond. Robles hit .400, with a slugging percentage of .829 and an on-base percentage of .512. Marinelli, a wonderful centerfielder, hit .381 with 11 doubles, two triples, a homer and 25 runs scored. 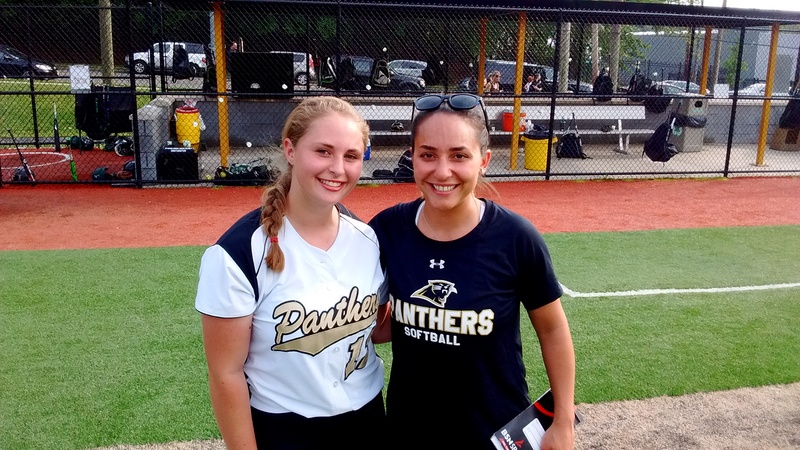 The junior will obviously be a key to next season’s success for head coach Nicole Velardi and the Panthers. ROOKIES OF THE YEAR: Julia Vardiman (center) of West Essex, Sam Burggraf of Newark Academy (right) and Cedar Grove’s Mia Faieta. 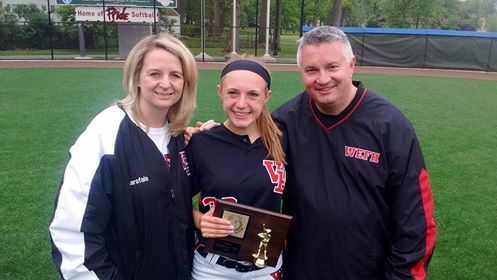 Vardiman was West Essex’s leadoff batter, and by season’s end, one of its most dangerous hitters. In the Group 3 semifinal, this future stud tripled and later homered. 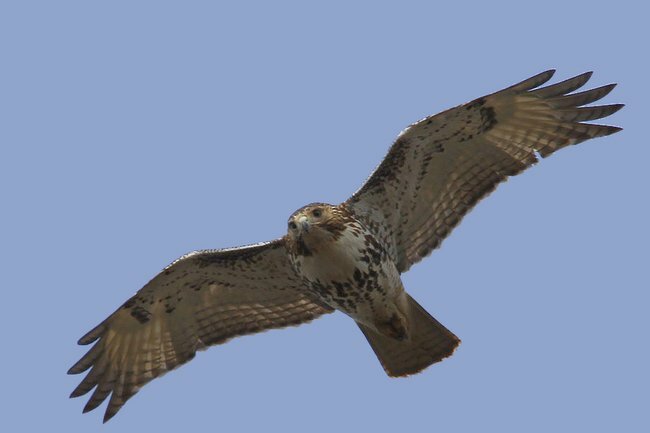 Her defense, at shortstop, was unflappable. 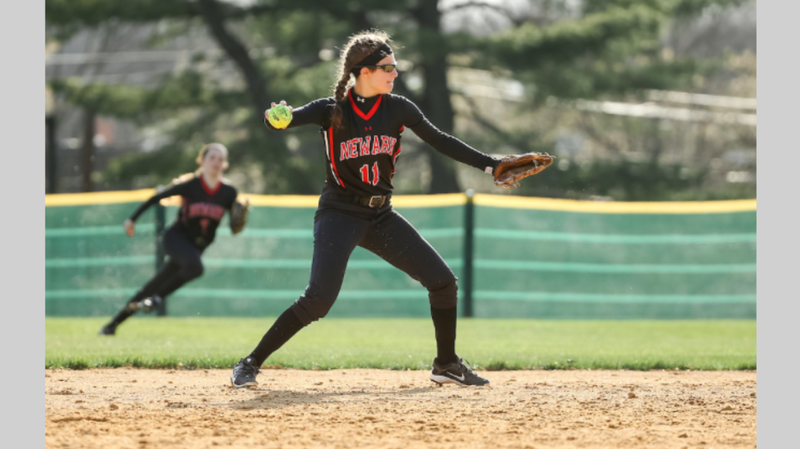 Burggraf hit .494 with a homer, 23 RBI and a team-leading 41 hits, while batting fifth in the lineup for Newark Academy, which won the SEC Liberty Division title. 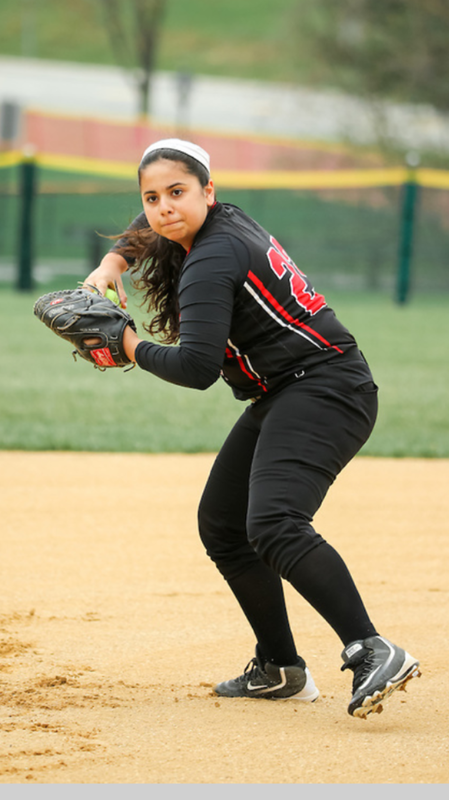 Faieta pitched a no-hitter, with 17 strikeouts in an Essex County Tournament contest, and showed tremendous potential all season long. She struck out 140, allowed just 41 hits and pitched to a 1.67 ERA. Faieta photo courtesy of jkennedyimages.com. Burggraf photo courtesy of Sergio Rodriguez). 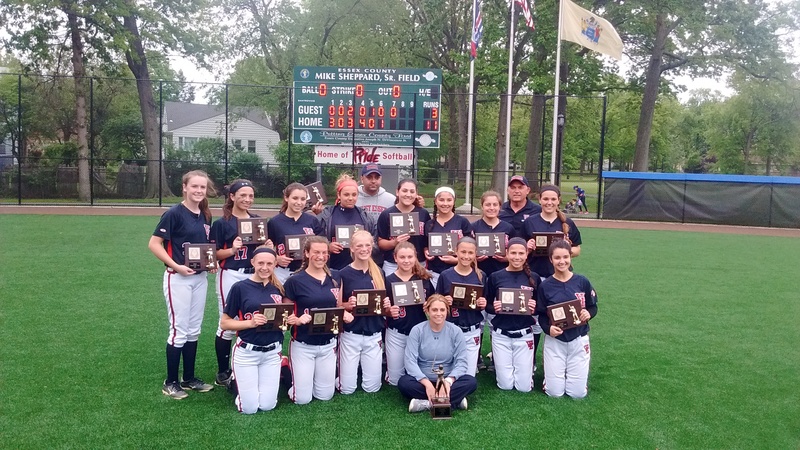 West Essex broke through, in a big way this spring, by finishing 26-3 and winning a conference, county and state sectional championship. SEC TEAM OF THE YEAR: Mount St. Dominic put together another great season and claimed its third straight championship in the elite SEC American Division. The Lions were led by standout players Kelsey Oh, Julianna Kocenski, Dani Dabroski and Sara Taffet. 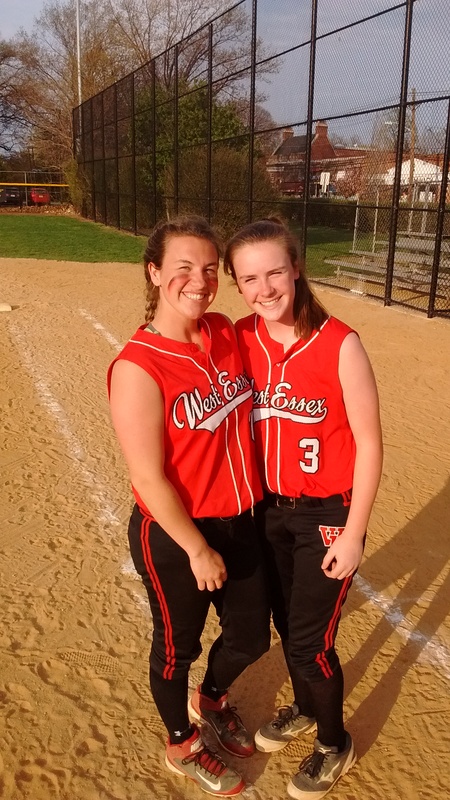 Kocenski had a flair for the dramatic, including two HUGE homers that won games against West Essex and Nutley. Mount St. Dominic eclipsed the 25-win mark for a third straight year. The Lions are 84-10 from 2014-2016. ESSEX COACHES OF THE YEAR: Read more on Montclair coach Phil Delgado and Livingston’s Jason Daily. ESSEX STUD OF THE YEAR: Read more on Sam Corio’s tremendous season for Bloomfield. 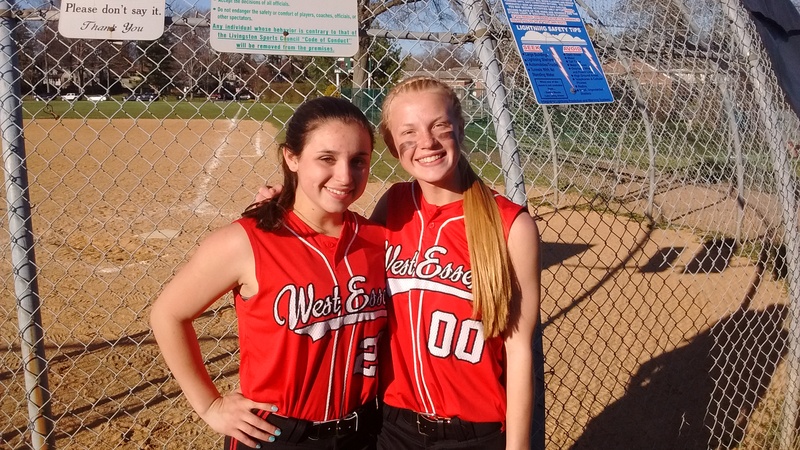 Madison Gemma (left, with teammate Bridget Betley) hit a long homer in the Essex County Tournament championship game, at Ivy Hill Park, in Newark. The left-handed batter hit a few majestic shots this season, as she recovered from a back injury which curtailed her 2015 season. 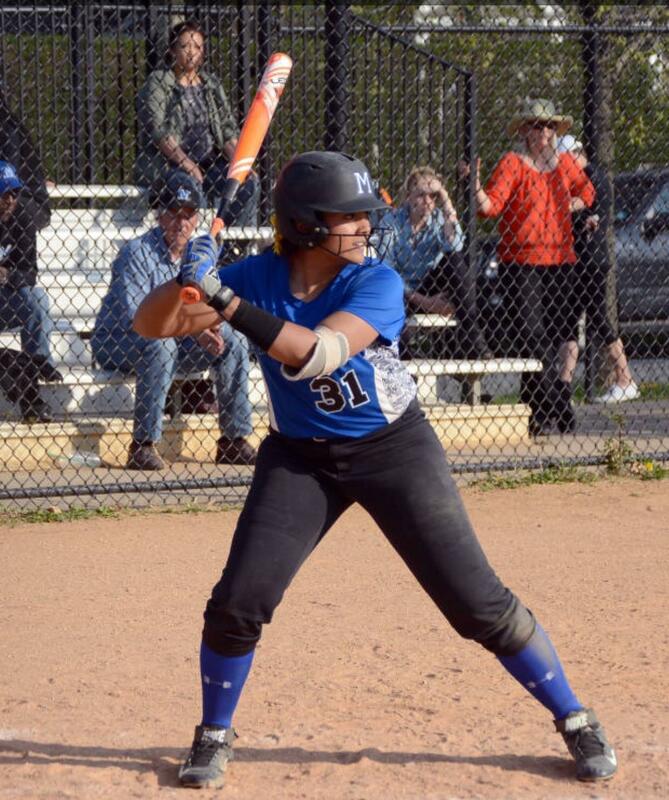 Erica Robles of Montclair hit four homers this season, including a blast in a game against West Essex in April that must have traveled 225 feet. 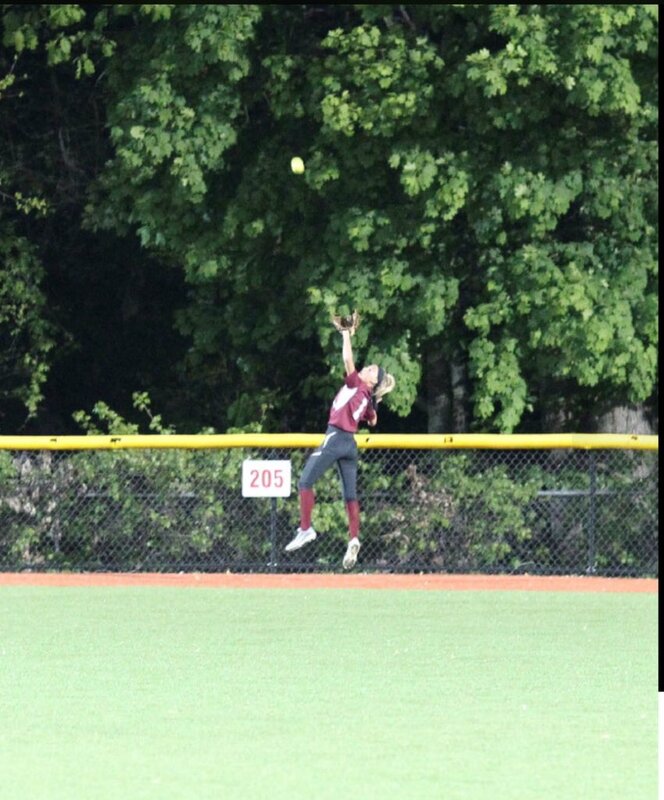 CATCHES OF THE YEAR: There was THE CATCH, which will be hard to match, as Bloomfield’s Samantha Corio brought the crowd at The Pond in Bloomfield to its feet when she hauled in a sure homer in centerfield on Bloomfield’s Senior Night. Corio made a few other brilliant plays in the field, too, over the course of the season. (Left: Corio makes the best catch this writer has seen in 40 years of watching high school softball. Right: Corio’s diving catch in a game against Montclair). 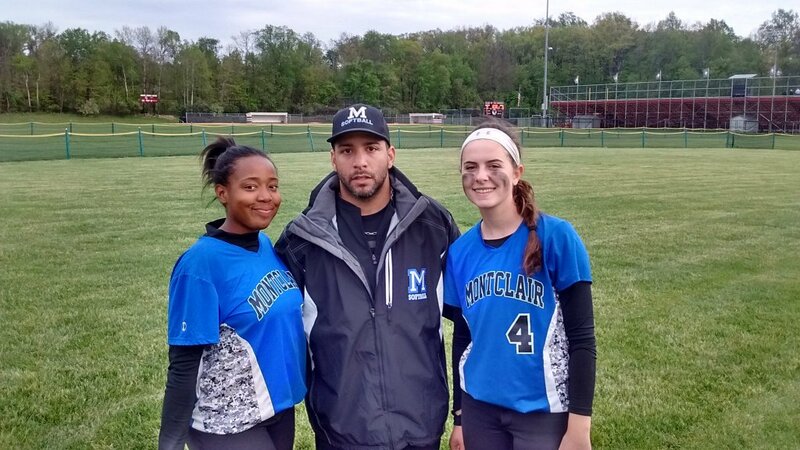 But don’t forget Montclair’s Ciarah Minning, who made an incredible play in centerfield, in as clutch a moment as possible, against Livingston in the Essex County Tournament semifinals on May 20, at Ivy Hill Park. 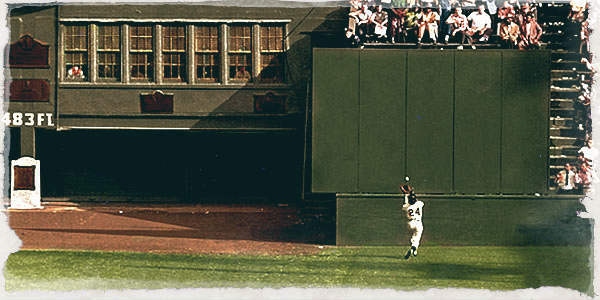 Minning’s catch (top, taken by NJ.com) and Willie Mays’ famous haul in 1954, were similar. Minning,. who will be among an excellent pool of talent returning to Montclair in 2017, made a Willie Mays-type, (1954 World Series) over-the-head catch of a long drive to dead center. Livingston actually went on to score three runs later in that inning, but Minning’s grab produced a huge out, or Livingston might have scored two more runs in the frame. GAMES OF THE YEAR: Mount St. Dominic and Nutley played two epic contests, with each team winning once, on its home field. Kelsey Oh and Emily Holden pitched both contests and were incredible. 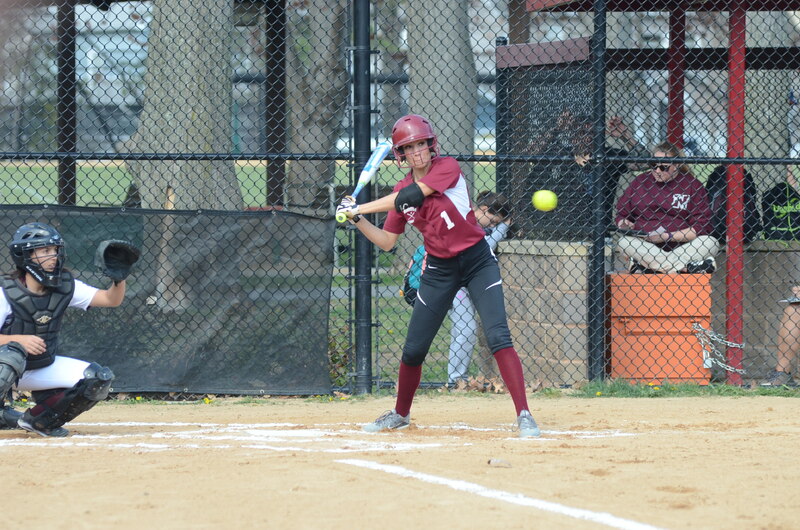 Nutley won the first game, 1-0, and held a 1-0 lead in the top of the 10th inning of the second matchup, before the Mount rallied to win, 4-1. Bloomfield and Montclair played a beauty, with the Mounties winning, 5-2, in 10 innings, on April 25. There was a little of everything in that game, including tremendous pitching. Montclair’s Jessie Masur pitched the entire game, and fanned 20. But the game of the year, in my estimation, was the Montclair-Livingston ECT semifinal, on May 20, at Ivy Hill Park in Newark. One of the loudest and enthusiastic crowds in years were on hand for this game, as the underdog Mounties continued a Cinderella run by defeating Livingston, 7-4. It was Montclair’s first win over Livingston since May, 2010, and moved Montclair into the final against the eventual champion, West Essex. Montclair’s defense was never better than in this game, as a young group of Mounties seemed to thrive in the added pressure of playing at night, in a charged venue. Despite the loss, Livingston would go on to a great end to its season, capturing a state sectional championship. Livingston coach Jason Daily would say later that the loss to Montclair actually gave him a good vibe that his team was ready for a big-time run in the state tournament. Sami and her mom, Mari. Sophie and her dad, Mike. 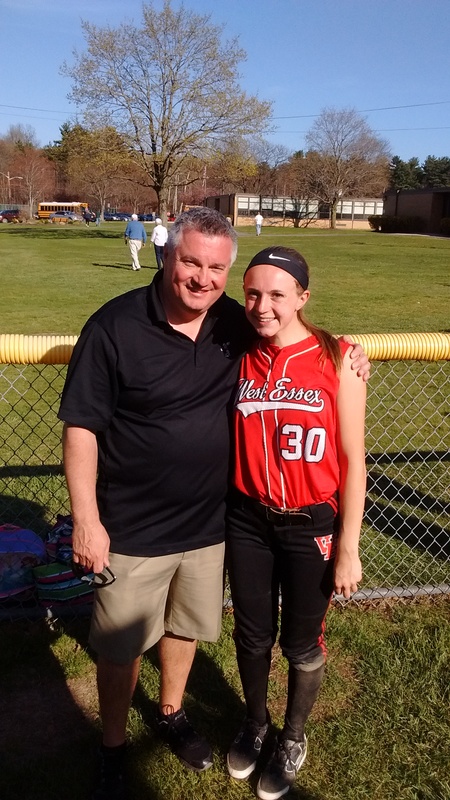 In addition to being a great player, Alexa Vardiman is also a standout student at West Essex. 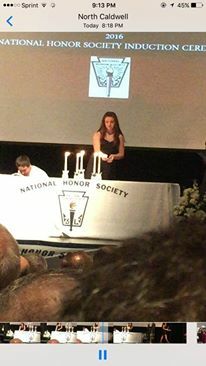 Here, she’s inducted into the National Honor Society. Will be hard to forget THE CATCH, by Sam Corio, in 2016. 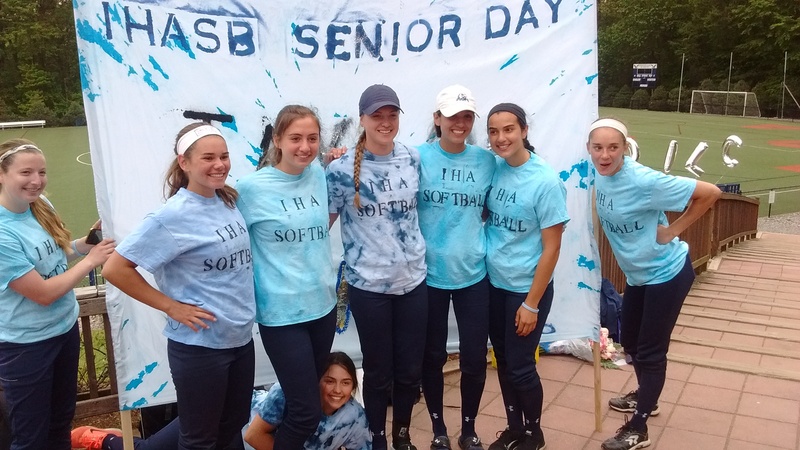 Olivia Sprofera (second from right) and Taylor Kenerson led IHA to a second straight state championship. 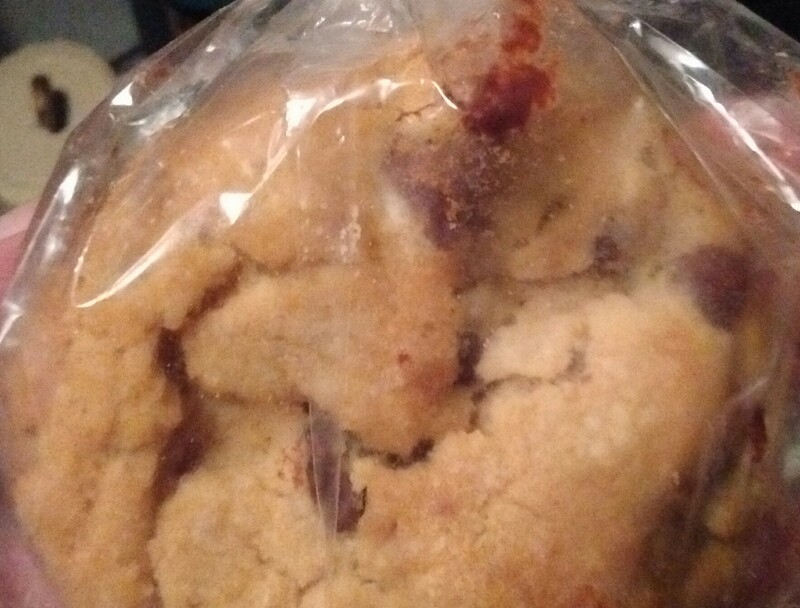 A few more photo moments from 2016, including the nearly famous ‘Faieta Chocolate Chip Cookies’ and good times during Essex softball games. 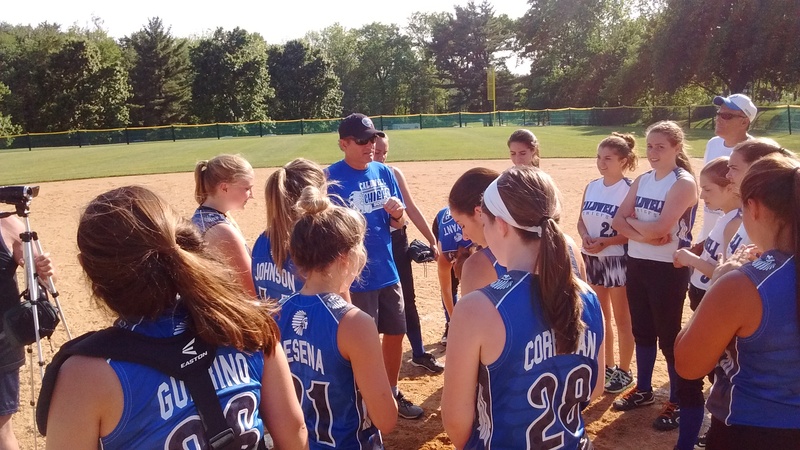 For 30 years, Mike Teshkoyan and his brother, Mark, have been leading the Caldwell softball program to incredible success. Caldwell is the winningest program in the Essex County Tournament, with 10 championships, in 11 finals appearances. 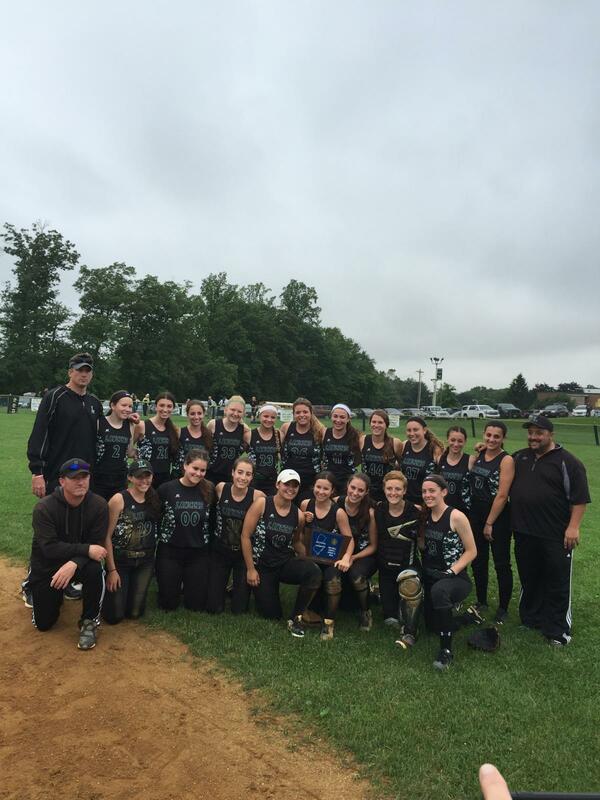 It has also won multiple state sectional titles and conference championships, as well as a Group championship. Along the way, Mike Teshkoyan (who is officially the head coach) and Mark are closing in on 640 wins, clearly the most in Essex County history. 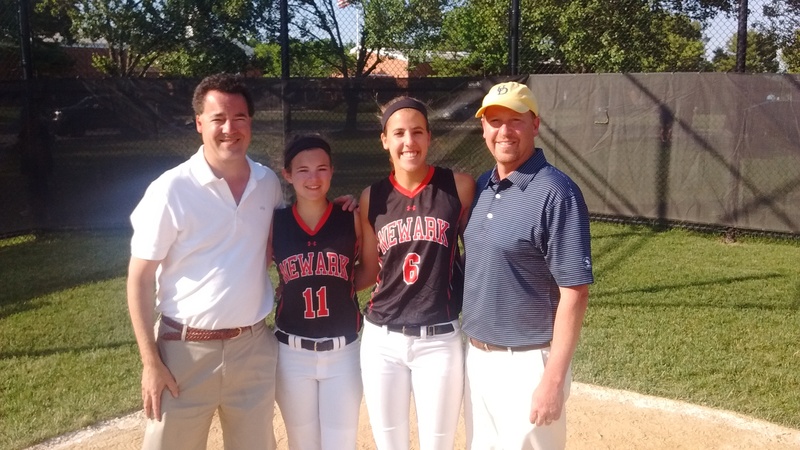 The Teshkoyans also rank among the all-time leaders for softball coaches in New Jersey. As for 2016, Caldwell finished 15-10 and was second in the Super Essex Conference’s (SEC) Liberty Division. “We were a team in transition this year after graduating eight seniors that helped us win two Liberty Division titles over the last three years,” said Mike. 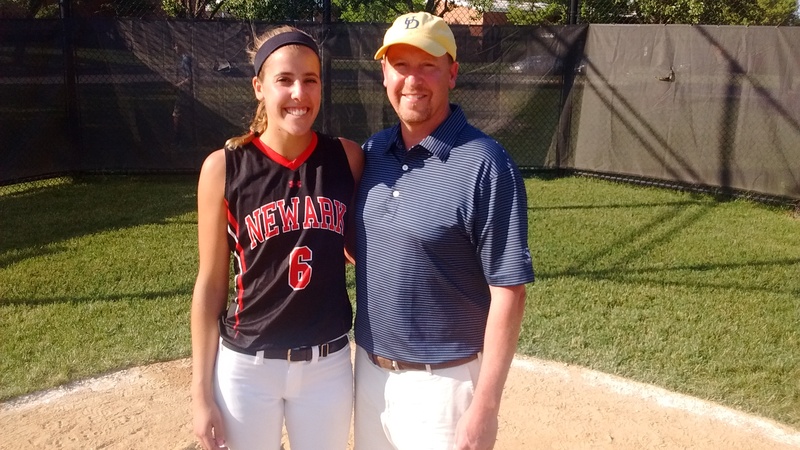 “That senior group was led by a bunch of four-year starters like Gianna Genello, who helped Rowan (University) advance to the Division III College World Series (this season). Gianna also set a school record at Caldwell, with 213 career hits. 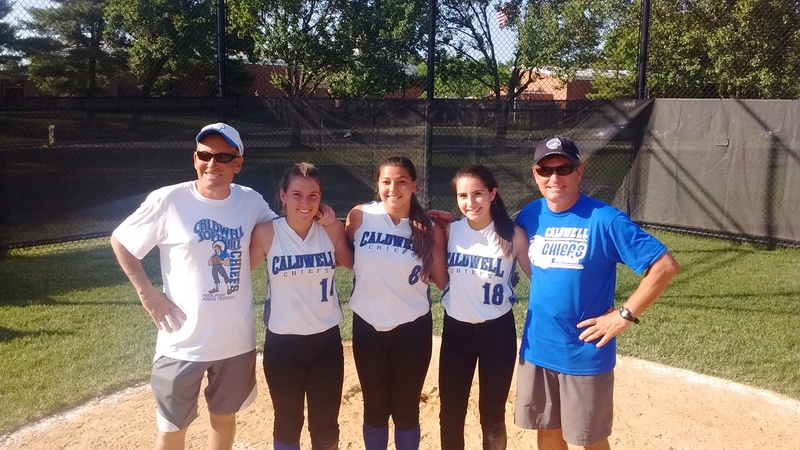 Caldwell coaches Mike Teshkoyan (right) and Mark Teshkoyan (left) are flanked by seniors (l to r) Shannon Johnson, Shauna Dietz and Nina Ricci, following the Chiefs last game of the season, a 4-2 win over Newark Academy. (Click on pictures for larger image). Losing players of that caliber is never easy, but Teshkoyan noted the ’16 Chiefs met the challenge. Shannon Johnson, the shortstop, will play at Lynn University in Boca Raton, Fla., this fall. Johnson finished her career with 110 hits in her career and batted .463 with 22 RBI this spring. Shannon Johnson finished her high school career in the Caldwell record books. She’ll play at Lynn University this fall. Nina Ricci, Caldwell’s second baseman, batted .325 with 24 runs scored. As to the future, Teshkoyan is very optimistic. Coach Mike Teshkoyan has long taught team unity and camaraderie to his Chiefs in 30 years of mentoring. Caldwell’s outfield is in good shape, with all three starters back next season. Anna Rowland, the centerfielder, batted .453 as the leadoff batter, scoring 34 times. Left fielder Alyssa Mermini batted.375 with 18 RBI. Taylor Bryant, who played right field, was also a key contributor. Sophomore pitcher Carlie Corrigan was 9-3 in SEC play. She helped hand Newark Academy its only loss in the Liberty Division in 2016, as Caldwell won its season finale, 4-2. “That game will give us some carry over momentum going into next year,” said Teshkoyan. “Carlie also batted .315 with 15 RBI and was 14-10 on the mound (overall). Taylor Stafford, the first baseman, was also a key asset, as the sophomore batted .377 with 34 RBI. The freshman class contributed, with four players stepping into varsity roles. Jaci Murphy played third base, Bridget Nicholas pitched and Ashleigh Bryant and Devon Stafford helped on the base paths. “We will have a nice blend of seniors and underclassmen and return 12 varsity members to next year’s squad,” said Teshkoyan. Millburn put together a tremendous season in 2016, finishing 22-4 while advancing to the NJSIAA, North Jersey, Section 2, Group 4 semifinals. The Millers also won a second straight Super Essex Conference (SEC) Colonial Division title, and will more than likely move up a division in 2017, to the SEC Liberty. Head coach John Childs had a somewhat veteran team this year, and will lose some valuable seniors to graduation this month. 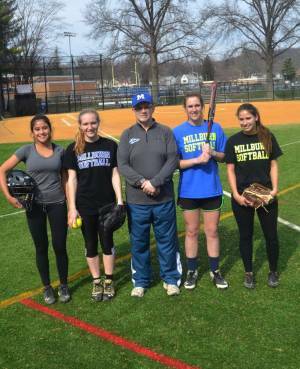 Next season could still be pretty good for Millburn, however, with a solid nucleus returning. As Childs noted, the Millers were a combined 45-8 over the past two seasons. The team won 14 straight this year, eclipsing the 12-game winning streak it put together in 2015. Millburn slugged to a .659 mark in 2016, besting the .640 percentage of a year ago. Millburn coach John Childs and the 2016 Millers. 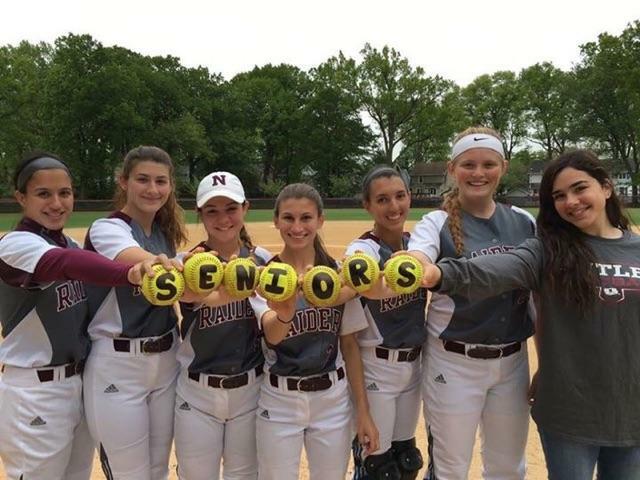 Millburn also showed its mettle against the SEC’s toughest conference, giving Nutley a good game before losing in extra innings, then defeating Bloomfield later that day, as part of a tournament held at Nutley. 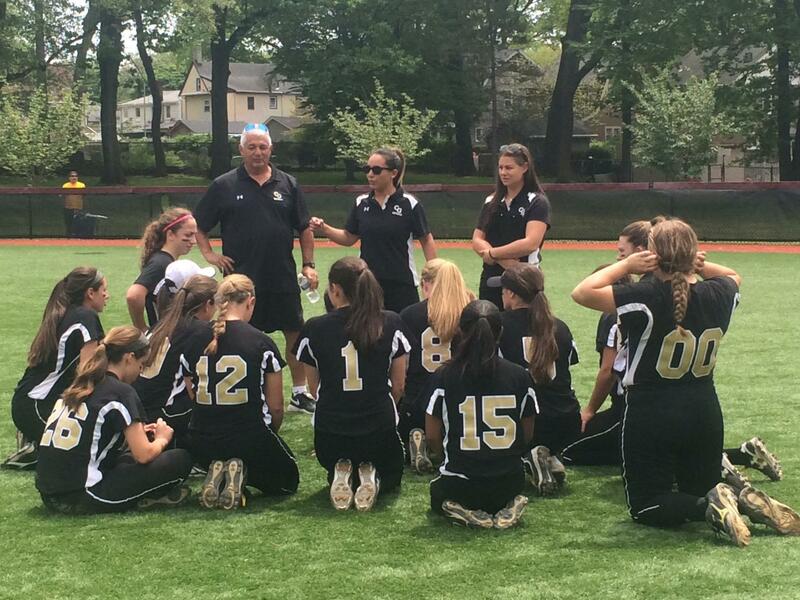 It also won two games in the NJISAA Tournament, before losing to Piscataway, 5-3, in the sectional semifinals. Piscataway was defeated by the eventual Group 4 champion, Watchung Hills, in a close sectional championship game. 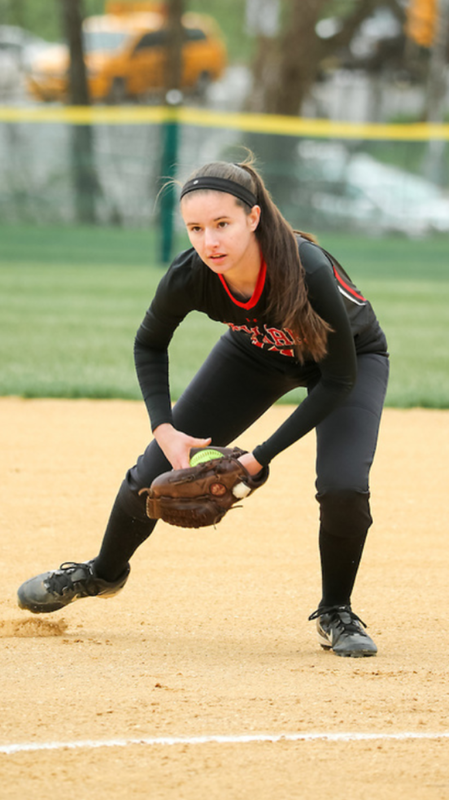 Rachel Hubertus, a junior shortstop, was phenomenal, batting .662 with an on-base percentage of .837. Her slugging mark was 1.394. Hubertus hit 12 homers, six doubles and five triples while stealing 12 bases, scoring 56 runs and drawing 20 walks. Hubertus set a team record for runs scored in a season, breaking her own mark of 52, set in 2016. She also put herself in somewhat glorified air by passing former Millburn great and later University of Notre Dame standout Alexa Maldonado, for career RBI. Hubertus enters 2017 with 136 ribbies. Maldonado had 101 during her career. Hubertus’ career batting mark, of .618, is also a record, surpassing Maldonado’s .525. (Both were/are Millburn shortstops). Senior pitcher and outfielder Jenna Dembner put together some solid numbers. In the circle, she was 12-0 with a 1.94 ERA. At the plate, Dembner hit .515 with 38 runs scored. She also homered twice and had 35 hits. Anna Mandel, a senior catcher, batted .535, with 38 hits, with a .690 slugging mark and .554 on-base percentage. “Anna threw out 11 of 25 base runners and only had one error behind the plate,” said Childs. Coming soon: Essex Player of the Year, Essex Pitcher of the Year; Essex Team of the Year, Essex Game of the Year.. In a season with some stud-like performances, Sam Corio’s overall game was fantastic for Bloomfield. The senior, who will play at Kean University, this fall, was a lock down defensive player in centerfield. On occasion, she was also called on to pitch, and her work at the plate resulted in over 100 career hits. Making diving catches in centerfield became second nature for Corio. Watching her throw out would-be base runners attempting an extra bag, usually at third base, or at home plate, seemed almost routine. But it was her play, on the night of May 12, which cinched the Stud award for the kid I called ‘Pleasant Colony‘. In a game against Newark Academy, at The Pond, in Bloomfield, Corio went back on what appeared to be a home run, and at the centerfield fence, jumped, and caught a ball that was clearly a few feet over the wall. One of the greatest catches I’ve ever seen. Corio robbing a player of a homer, on May 12. (Please click on photos for larger images). Corio enjoyed the praise, but was pretty ho-hum about the play. On the night she made that catch, Corio also collected her 100th career hit. She enjoyed the moment with her parents, after the game. The play helped Bloomfield win a thriller on its Senior Night, and to make it even better, Corio scored the game-winning run in the bottom of the seventh inning, as the Bengals rallied to win, 7-6. Bloomfield was leading, 5-2, in the top of the seventh, before Newark Academy rallied to take a 6-5 lead. 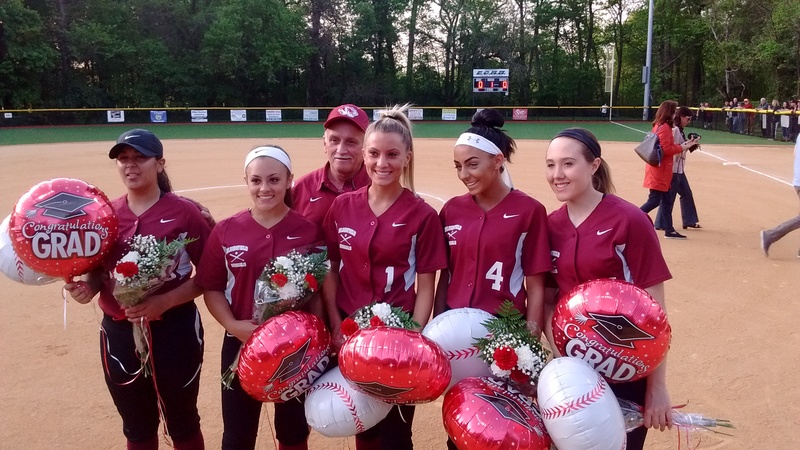 Bloomfield players enjoyed its Senior Night, along with coach Bob Mayer, on May 12. Corio’s arm strength was tremendous. I remember being at a Bloomfield-Livingston game early in the season, at The Pond. Livingston had a runner on first and a clean single meant the runner should easily get to third. Corio scooped up the ball and threw a laser to third. Livingston coach Jason Daily, who figured his player would easily make it to third, had to implore the runner to slide hard. The player beat the throw, but you could actually hear the ball sizzling to the bag. Diving catches were the norm for Corio. Corio could also swing a good bat for the Bengals. (Photo courtesy of Joe DiFranco). In Corio’s last high school game, against Kearny, in the state tournament, she threw out a base runner at the plate, from deep centerfield. The stats are impressive. Corio hit .438, with four homers, 21 RBI and 35 hits. She had a .516 on-base percentage, five doubles and two triples. She was 11-for-13 in stolen bases and made just two errors all season. In the circle, Corio was 6-3, with a 3.28 ERA, striking out 45 in 60 innings. Corio will continue her education at Kean University this fall, where she aspires to be a teacher. And she’ll also play softball in a very good conference. Here’s hoping for continued success, Pleasant Colony. 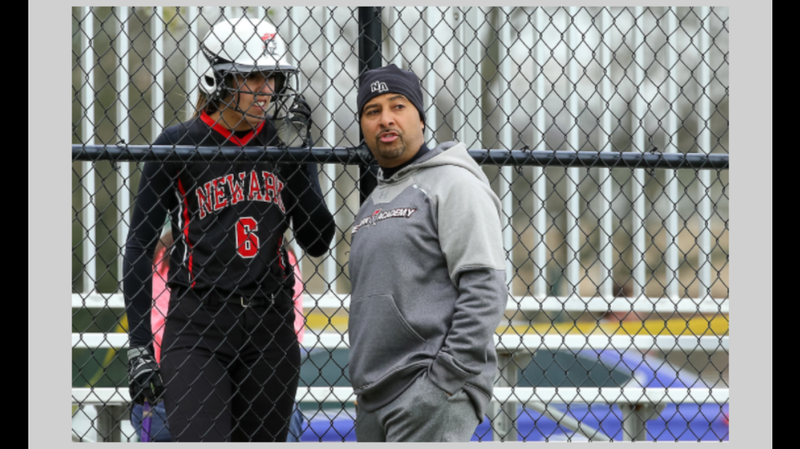 Newark Academy softball coach Sergio Rodriguez will say, without hesitation that no one has it better than him. Sam Burggraf. (All photos courtesy of Sergio Rodriguez. Please click on photo for larger image). The Minutemen were 19-9 this season, and won a Super Essex Conference (SEC) championship. The team also advanced to the North Non-Public B final, where it was defeated by the eventual four-time state champion, Lodi Immaculate. Newark Academy’s success will most likely earn it a promotion in 2017, where it could play in the SEC’s American Division, one of the most elite conferences in North Jersey. Newark Academy was 11-1 in the Liberty Division this year, with its only defeat in the regular season finale, to Caldwell. Among its setbacks this year were losses to the state’s top team, Immaculate Heart Academy, Lodi Immaculate, two close games to state sectional champion Livingston and a 2-1 loss to Jefferson early in the season. 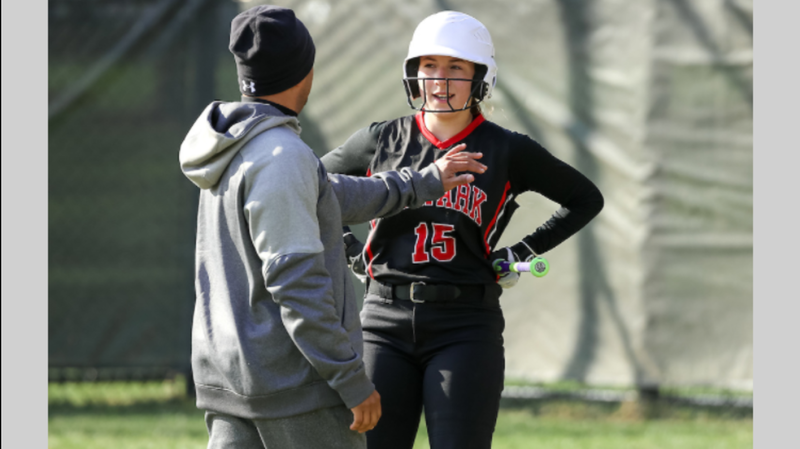 In addition to playing competitive softball, a Newark Academy player has to work hard in the classroom, where academics are always the first priority. The senior class was paced by some tremendous players. 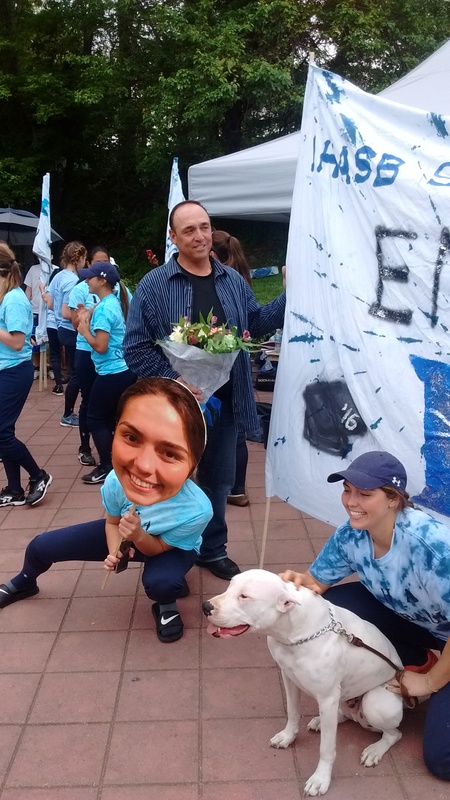 Rebecca Mandelbaum, a second baseman, who will play at Brown University this fall, collected her 100th career hit and batted .333 on the season. Serg and Rebecca celebrate Mandelbaum’s 100th career hit. First baseman Sophie Rosenberg (Arts and Letters) batted .359 with a homer and 23 runs scored. She’ll attend Tulane University this fall. Coach conferring with Arts and Letters. Hannah Rosenbaum, a senior left fielder who will attend the University of Michigan, had 18 hits and drove in 20 runs and Paige Cooper, a right fielder, scored 12 runs. Cooper will start college this fall at Northeastern University. The nucleus of the team is strong. The Minutemen got excellent pitching from Mallory Shaw, a sophomore, who, in over 174 innings of work, struck out 161 and pitched to a marvelous ERA of 1.61. She pitched in all 28 of her team’s games. Shaw was also a force at the plate. Batting third in the lineup, she led the team with 31 RBI, 13 doubles and a .679 slugging percentage. Freshman third baseman Sam Burggraf was marvelous at the plate, hitting .494 with a homer, 23 RBI and a team-leading 41 hits, while batting fifth in the lineup. Sam Keller, a freshman centerfielder, batted .378 with two homers, 19 RBI and led the team with 31 runs scored and seven triples. Maddy Mudrick, a sophomore shortstop, hit .350 while freshman catcher Caitlin Clancy hit .288 and led the team in home runs, with three. 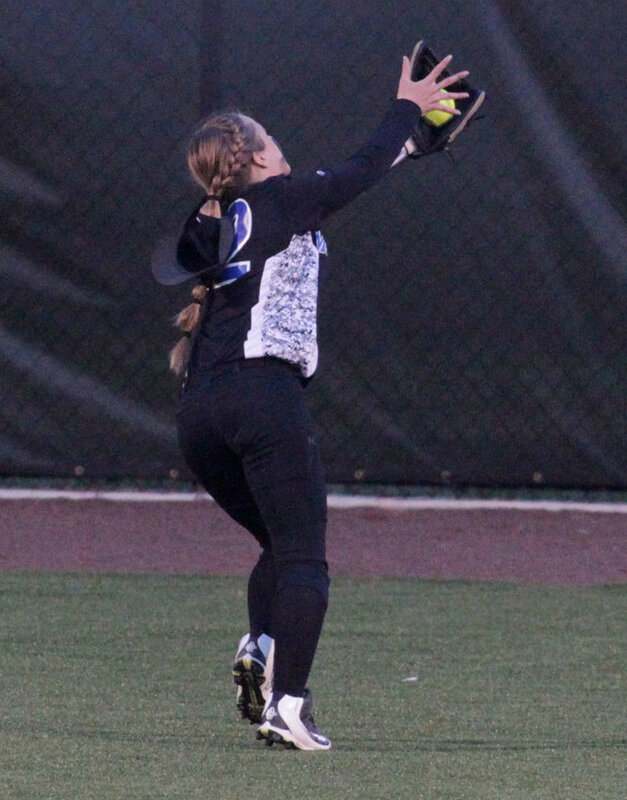 Sophomore Libby Stein shared the right fielder’s job with Cooper, drove in a pair of runs and scored seven times. 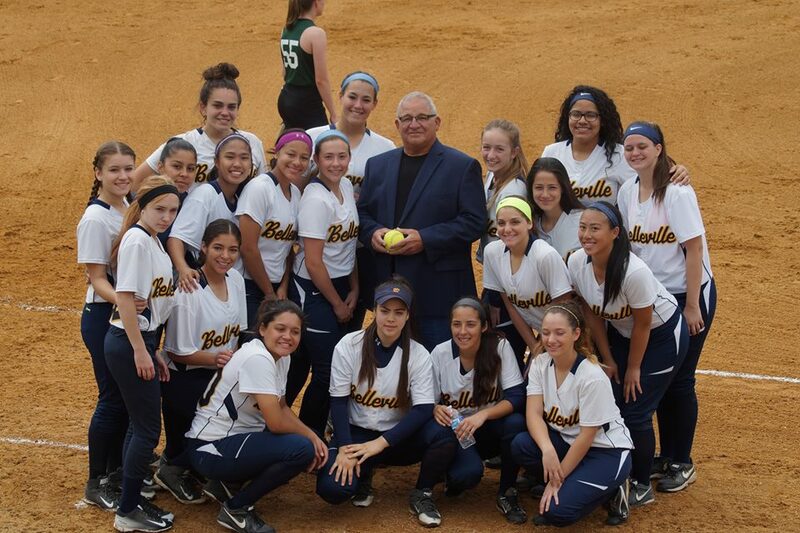 Rodriguez’s work as a coach also transcends into the summer, where he is the leader of ‘The Heist’, a very popular team, which has enjoyed great success, with a number of Essex County-based players. Special day for seniors Rebecca Mandelbaum (second from left) and Sophie Rosenberg, along with their dads. 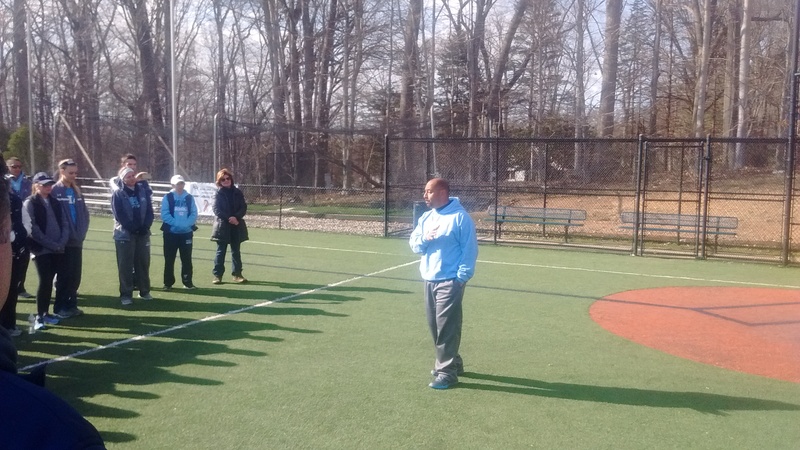 He was also a close friend of the late IHA coach, Anthony LaRezza and took a few minutes, early in the season, to address the IHA team, telling the players that their maximum potential was good enough to be state champions. And he was right, as the Eagles finished 31-1 on the season and ended up as the state’s best team. As for his team, the future is now. 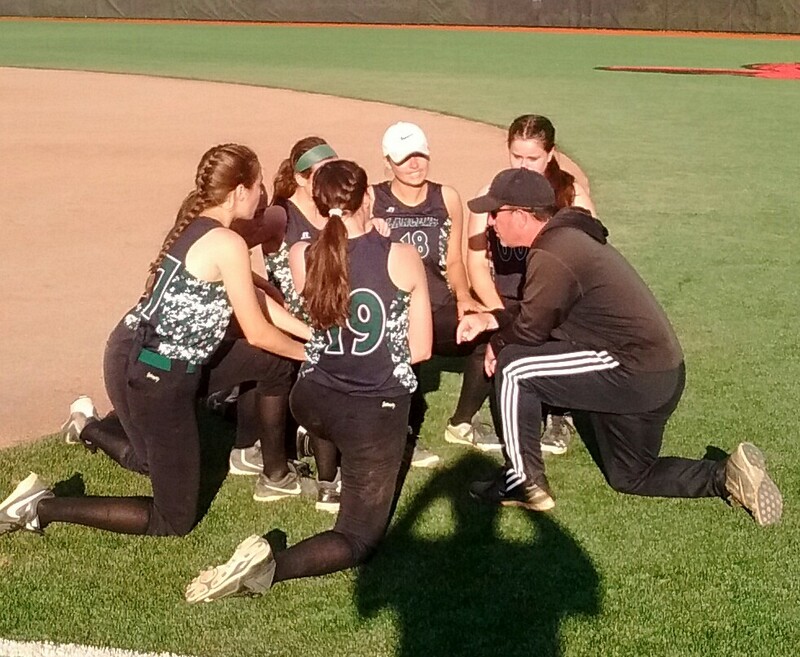 Taking photos of some of the players in Essex County (and occasionally Immaculate Heart Academy) softball, following games, had a nicer twist when the parents and coaches would join the kids for what was usually a look back at a victory. AND PLEASE CLICK ON ANY OF THE PHOTOS TO SEE A LARGER IMAGE. 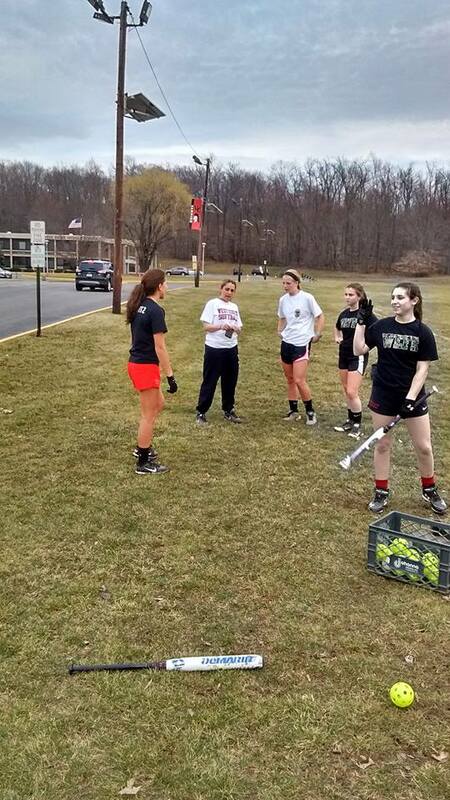 West Essex coach Andrea Mondadori and some of her players enjoyed a warm day of practice in mid March. Sami Huetter and her new bat had a good season in 2016. Coach Mondo and two of her junior studs, Alexa Vardiman (left) and Sami Huetter. 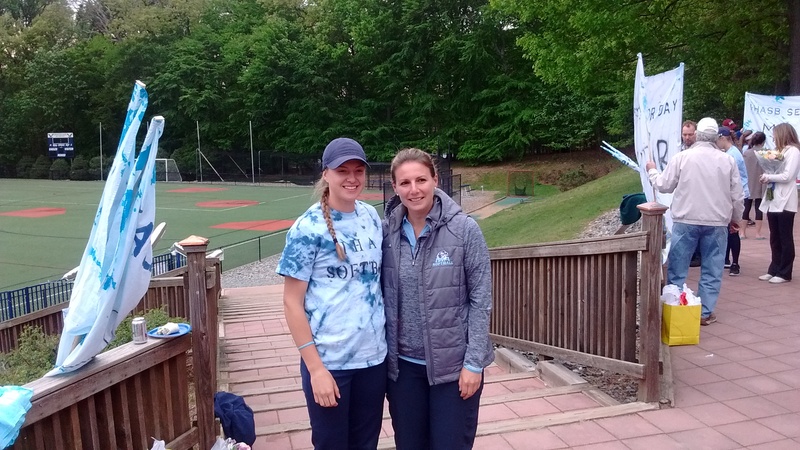 Alexa Vardiman (left) and the incomparable Bridget Betley, following a win at Montclair in April. 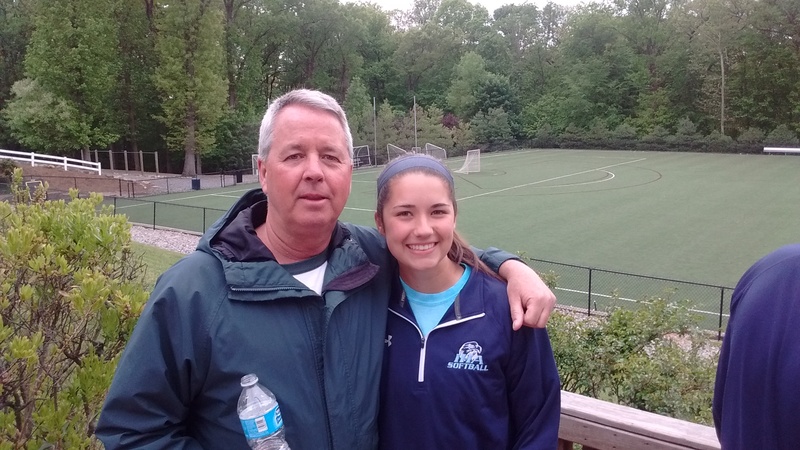 Reagan Jones and her dad, Bob, following a tournament at Cedar Grove. 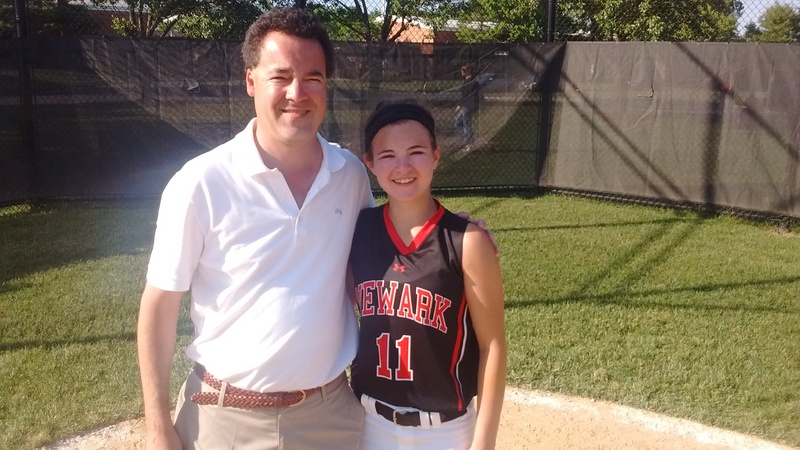 Amanda Garofalo and dad, Bill, after a tournament game at Emerson. 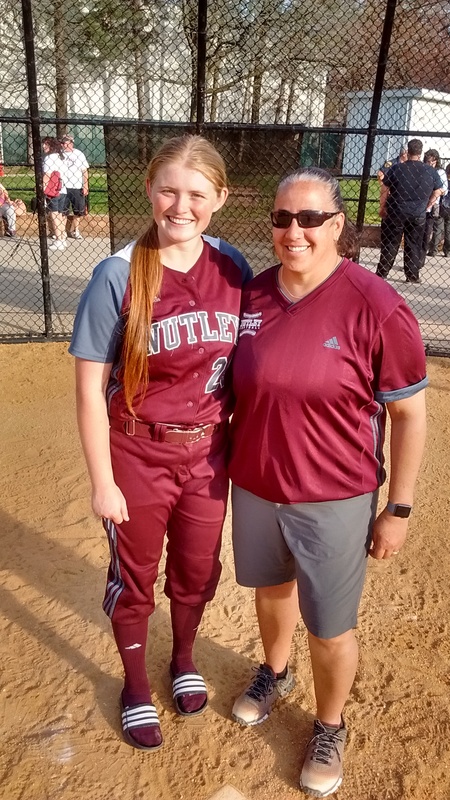 Nutley coach Luann Zullo and star pitcher Emily Holden, following a win at the Pond in Bloomfield. Stefanie Ziemer and dad, Bill, after a Nutley victory at Bloomfield. 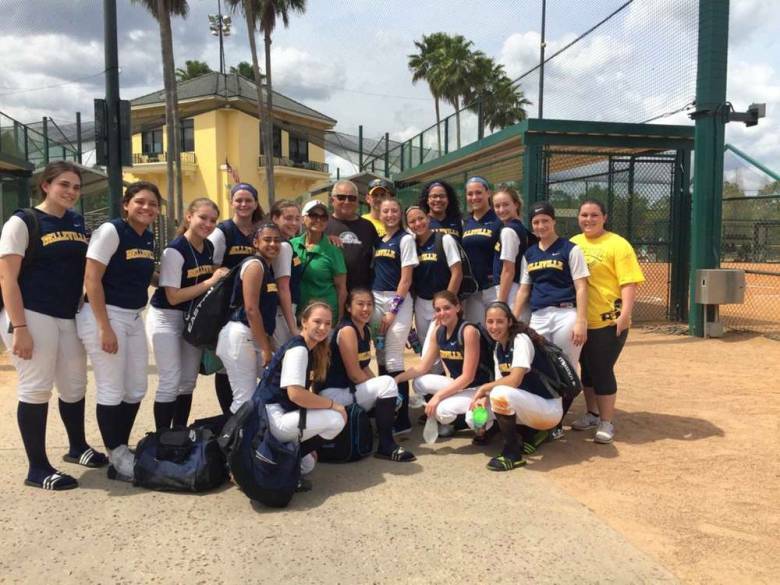 Belleville High softball team, with former coach Carl Corino, during a trip to Florida in March. Sami Huetter and Lilly James. 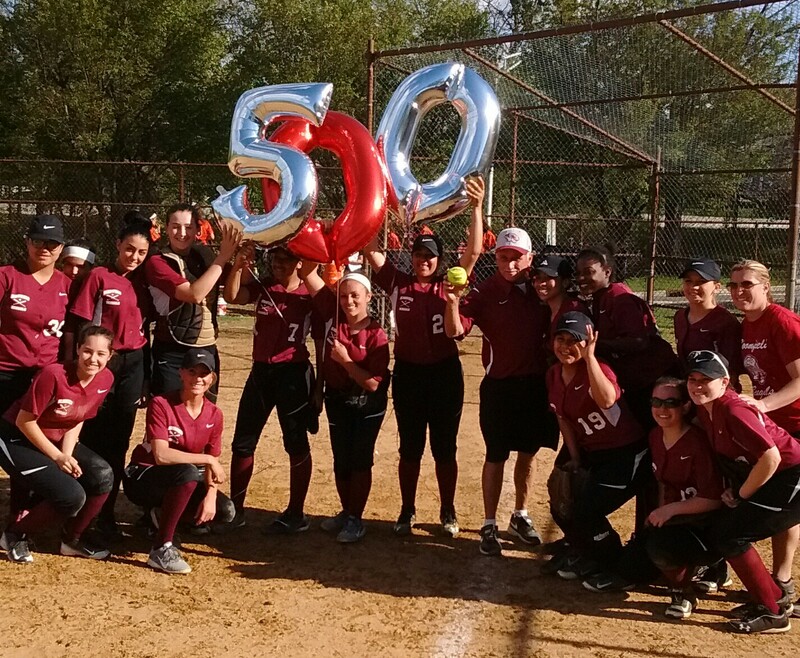 Bloomfield players celebrated Coach Bob Mayer’s 500th win in April. Taylor Kenerson and her dad, Kevin. West Essex players with Mondo after her 200th career win. 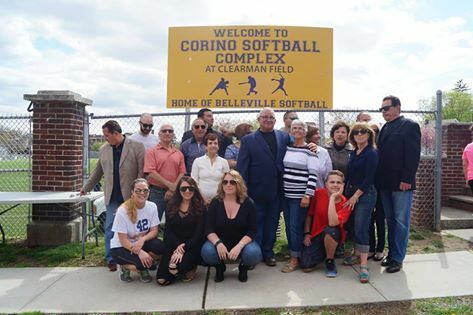 Belleville softball players celebrate a special day, as the team’s softball field was re-named in honor of former coach Carl Corino (center) on April 23. 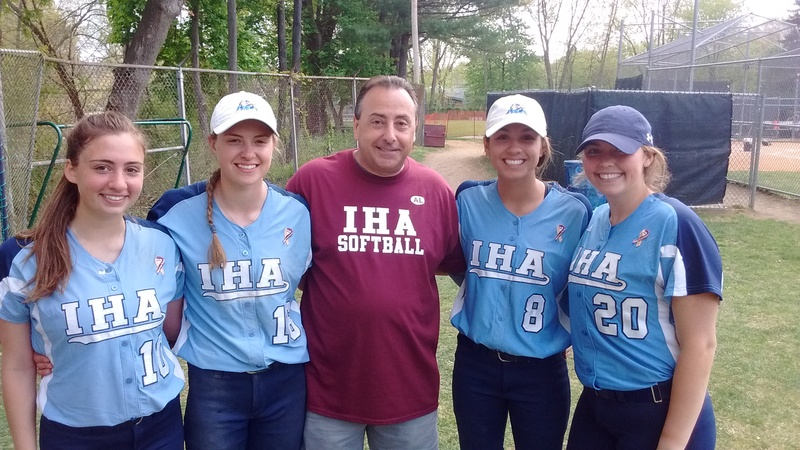 Joe LaRezza, with IHA players (l to r) Olivia Sprofera, Taylor Kenerson, Sonia Sharma and Emilie Cieslak. 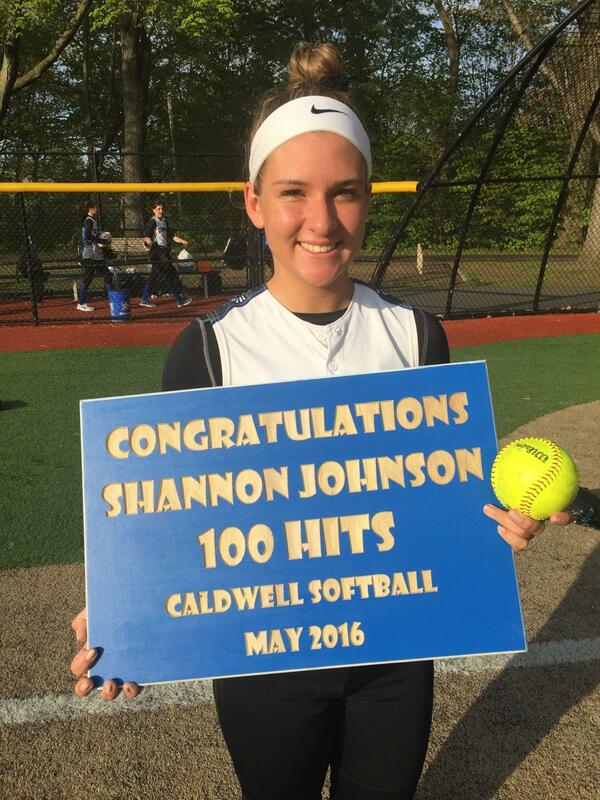 Caldwell’s Shannon Johnson collected her 100th career hit in 2016. Nutley coaches Mike DiPiano and Luann Zullo congratulated Emily Holden (second from left) and Breana DeMaio on their college choices. 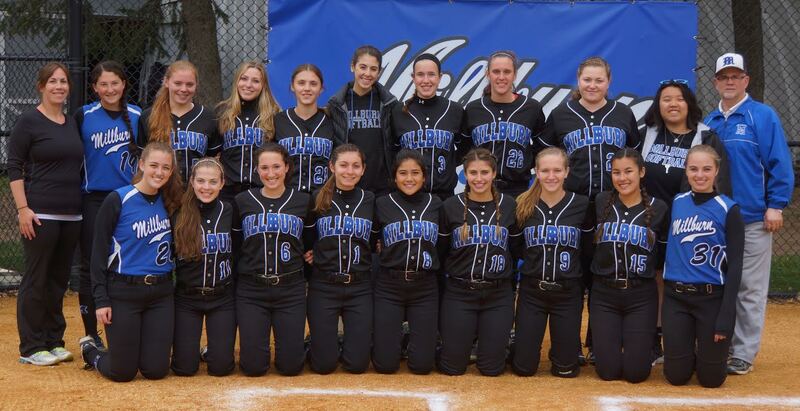 It was a tremendous year for Millburn’s softball team, with a second straight conference title and two wins in the NJSIAA Tournament. 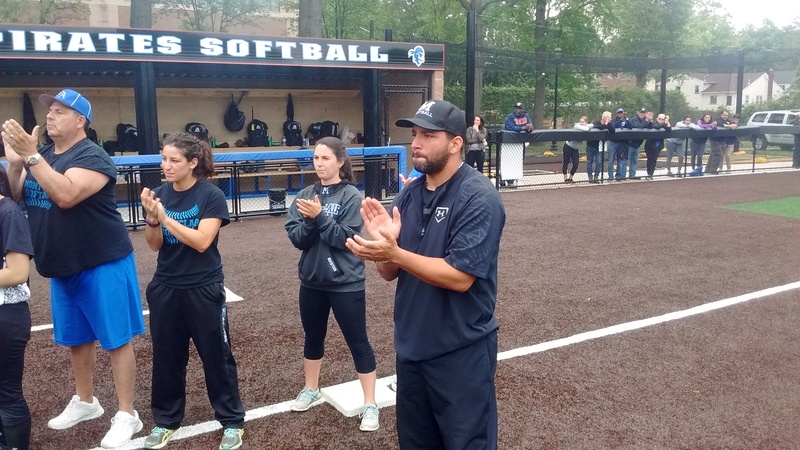 Montclair coach Phil Delgado, with Amber Matthews (left) and Jessie Masur, after a big win at West Essex. 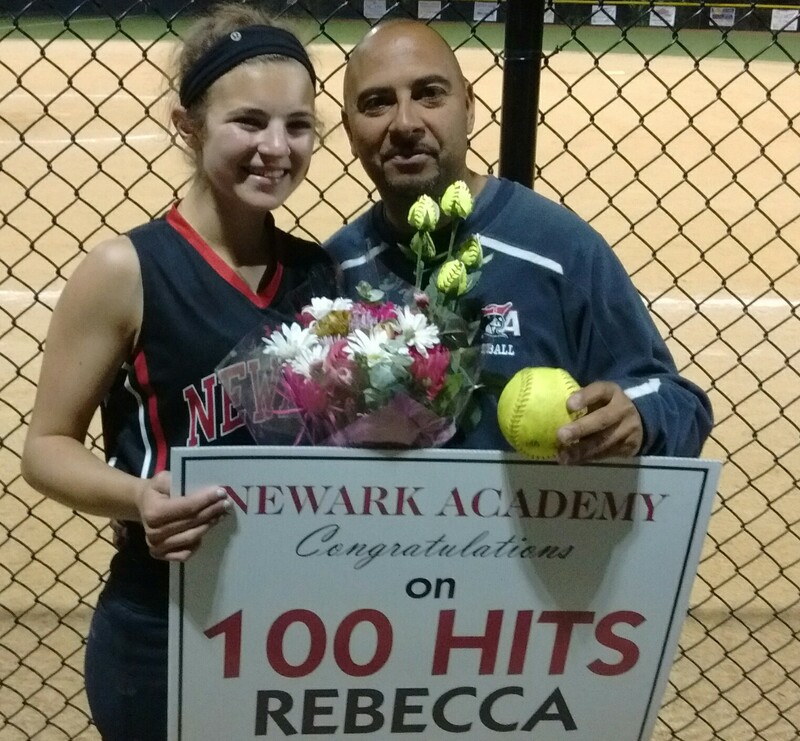 Newark Academy coach Sergio Rodriguez congratulates Rebecca Mandelbaum on her 100th career hit. 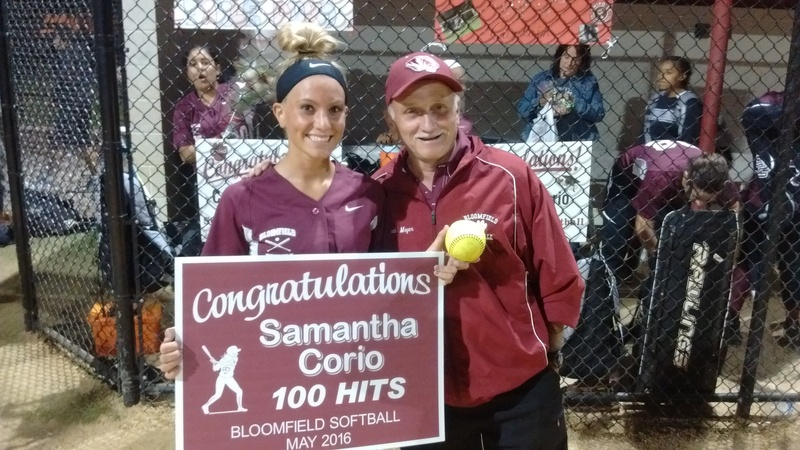 Bloomfield’s Sam Corio, with coach Bob Mayer, after her 100th career hit. Livingston players were thrilled to present head coach Jason Daily with his 300th career win this season. 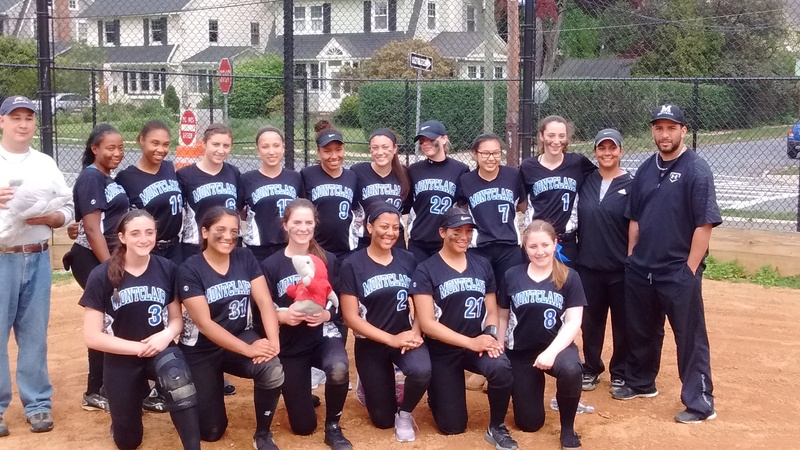 Montclair players had a big win over a great Mount St. Dominic team in the county tournament. Ed Bates (far left) and coach Phil Delgado (far right) join in. Special day at West Essex. 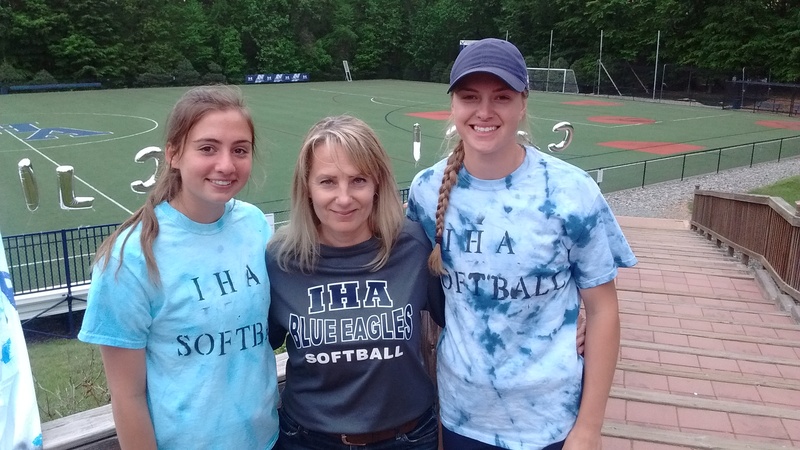 Taylor Kenerson (far right) with her mom, Lisa, and IHA pitcher Olivia Sprofera. Kylie Carr and her dad, John. Madison Gemma (left) and Bridget Betley, with a ‘Bridget of Madison County’ moment after winning the county title. Montclair players getting ready for a county final. Olivia Sprofera, with her parents, Sevan and John. Celebrating a county title at IHA. 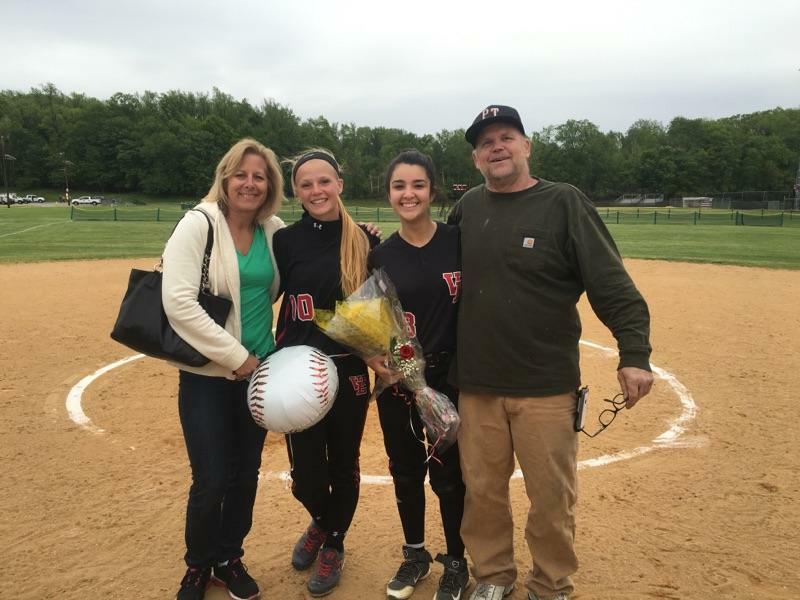 Amanda Garofalo and her parents, Michele and Bill. 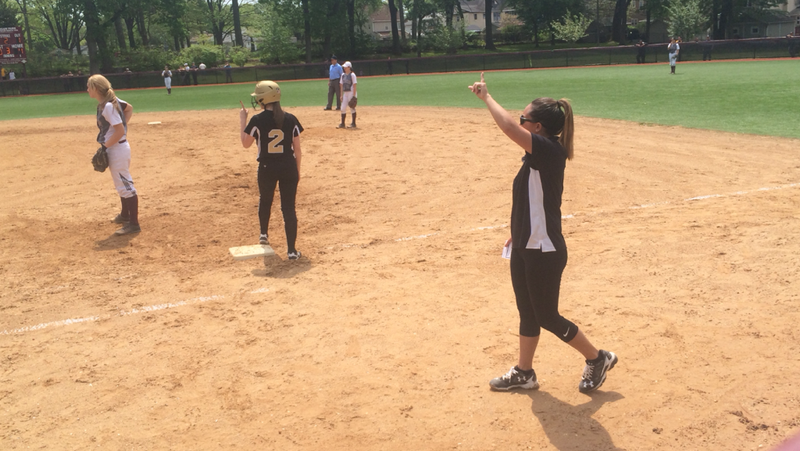 Cedar Grove coach Nicole Velardi and Kali McCabe. 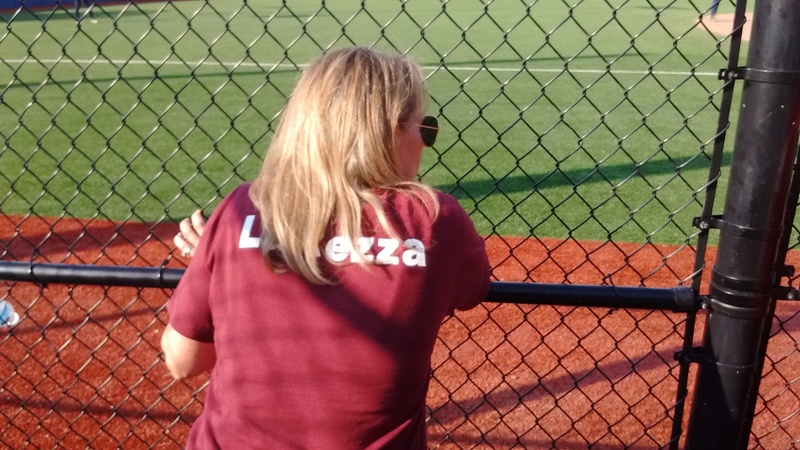 Hall of Fame coach Luann Zullo, of Nutley, won her 400th career game in May. Caldwell coaches Mike Teshkoyan (right) and Mark Teshkoyan, with some tremendous players. Rebecca Mandelbaum, and her dad, Rich. Sophie Rosenberg and her father, Mike. Sami Huetter and her mom, Mari. 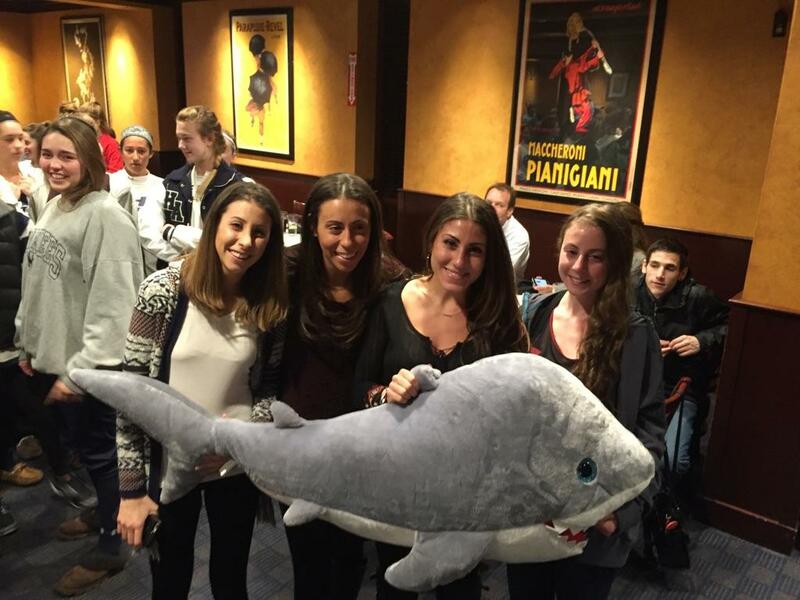 Amanda Garofalo (right) and Alexa Vardiman. Bridget Betley and her dad, as Sami Huetter pretends to pound on Alexa Vardiman’s head (far right). 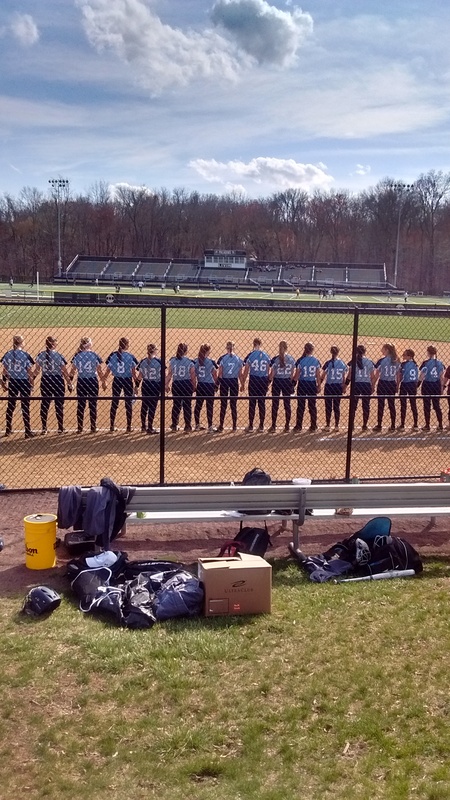 Livingston players take a moment after the team’s final game in Group 4 semis. 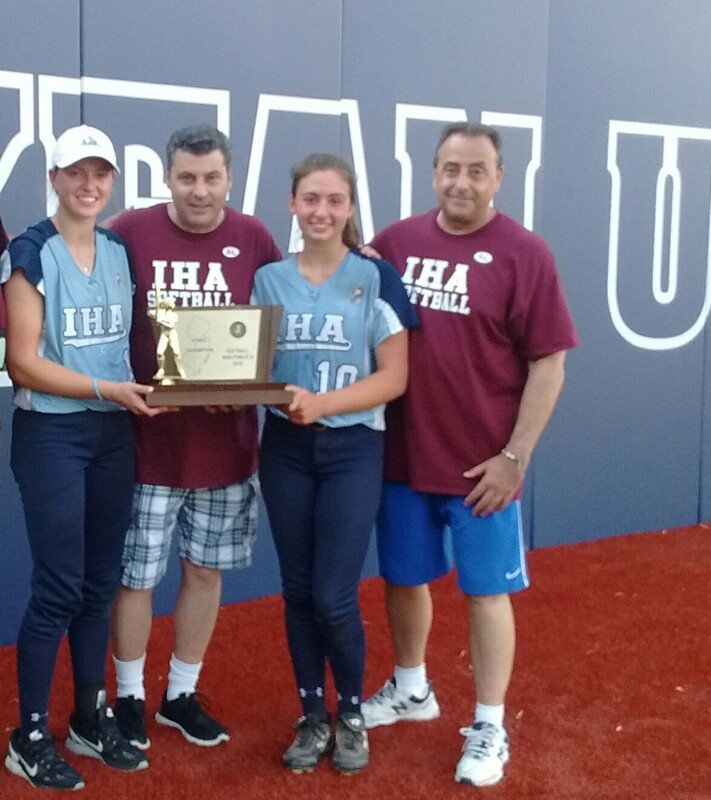 IHA players Taylor Kenerson (far left) and Olivia Sprofera are joined by Allen LaRezza (second from left) and Joe LaRezza after a state championship on June 11. 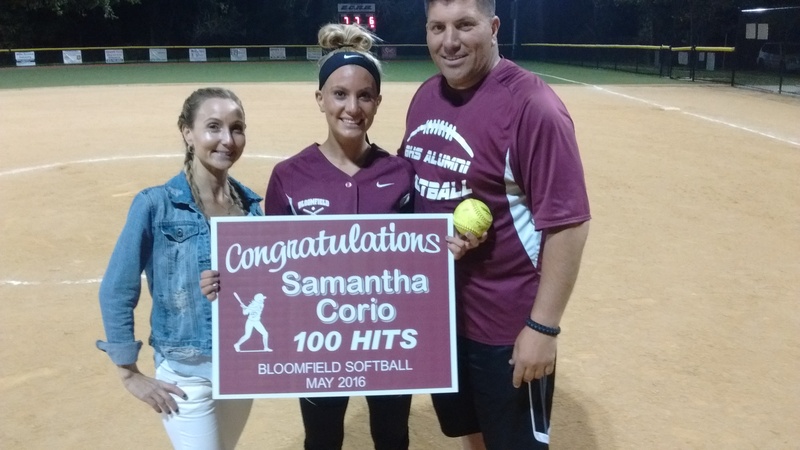 Bloomfield’s Sam Corio, with her parents, on a big Senior Night. 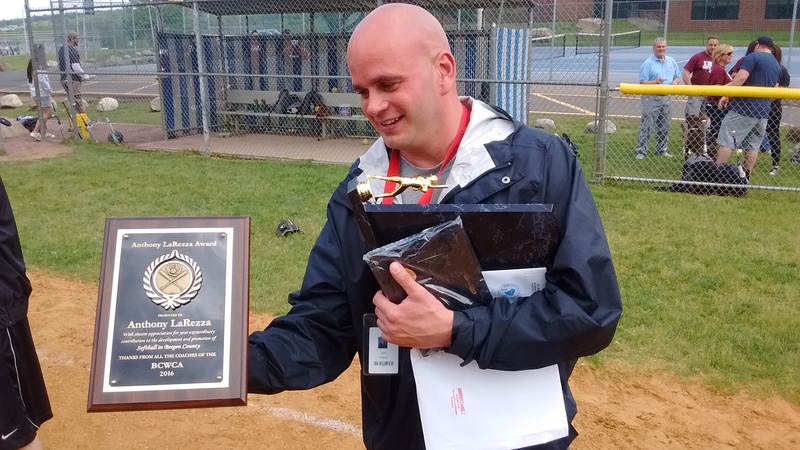 It was difficult to name just one Coach of the Year in Essex County softball in 2016, at it was for some other categories. So, why not just honor two coaches with the accolade, as well as remembering some tremendous milestones among other coaches in the county. Montclair coach Phil Delgado is recognized for guiding a young team out from a tough start to the Essex County Tournament championship game. Montclair’s Phil Delgado is a FMTC Coach of the Year. (Click on all photos for larger images). While the Mounties did not qualify for the states, mostly in part because of that bad start, no team was tougher to handle down the stretch. 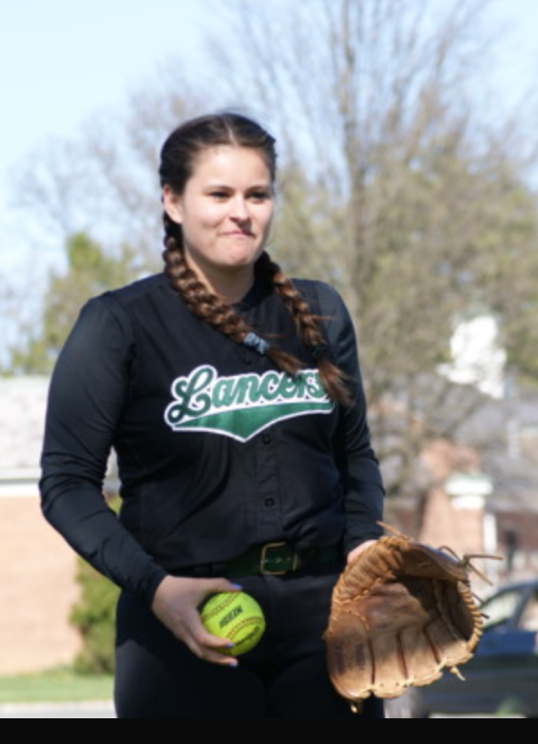 It might have started with a 5-2 win, in 10 innings, over Bloomfield, as junior pitcher Jessie Masur struck out 20, on April 25. Delgado congratulates his team after a big win over Livingston in the ECT semifinals. 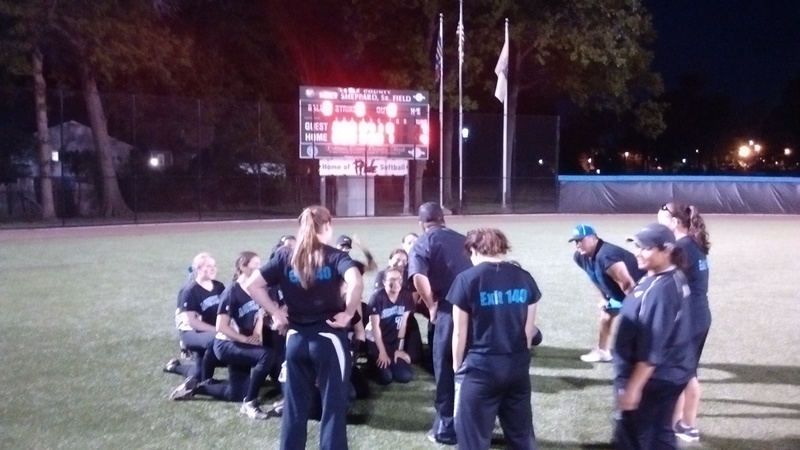 Montclair was 3-13 at one point before embarking on a seven game winning streak, including victories over eventual state champions Lodi Immaculate, Livingston and West Essex, as well as the two-time defending county champions, Mount St. Dominic in the county quarterfinals, and good wins opposite Caldwell, Ridgefield and Cedar Grove. Delgado, here with Amber Matthews (left) and Jessie Masur, after a nice win at West Essex. The streak ended in the county finals, as West Essex won the title, 11-3, but it didn’t take away from the job Delgado, in his second season, did with a young team that seems primed for good things in 2017. Delgado, who often said he was on an island (hence PDG Island) has often referred to Livingston coach Jason Daily as a mentor, and one of the best coaches he’s ever been around. With that said, Daily shares the Coach of the Year award with Delgado. 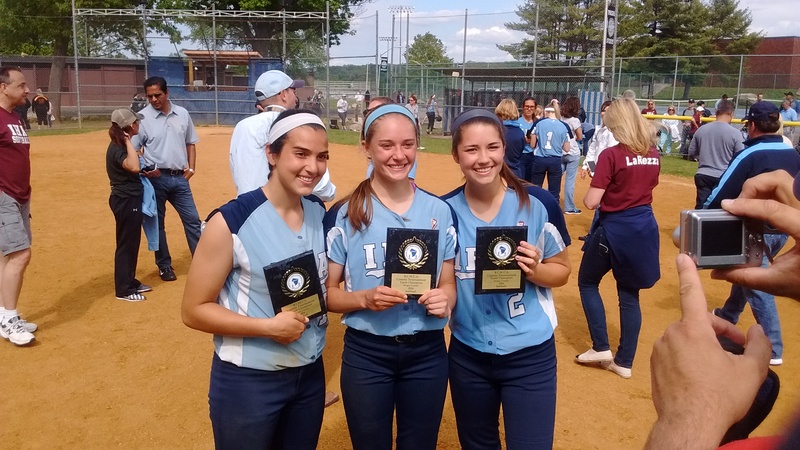 Livingston was a .500 team for most of the season before a late-season surge that resulted in a state sectional title in North Jersey, Section 1, Group 4, which was culminated by a 13-3 win over Morris Knolls in the sectional final. It was the third state title for the Lancers in the last five seasons. In the Group 4 semifinals, the Lancers played a tremendous game against Watchung Hills, before losing, 2-1, to the eventual Group 4 champs. (The game was tied, 1-1, in the seventh inning, before Hills scored the winning run). 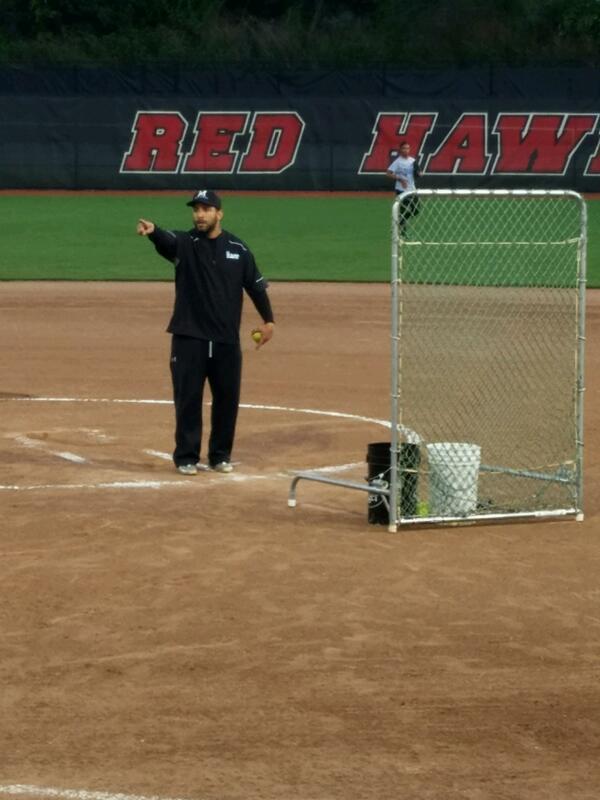 Jason Daily, doing what he loves the best about coaching. Delgado was the first to laud Daily. Ironically, Livingston’s run began after the Lancers were eliminated from the Essex County Tournament in an electric semifinal game at Ivy Park. It was the first time Livingston had lost to Montclair in six years. Daily had seen steady improvement in his team, and despite the 7-4 setback, felt his team was ready to make a run in the state tournament. Livingston players celebrate Coach Daily’s 300th win. 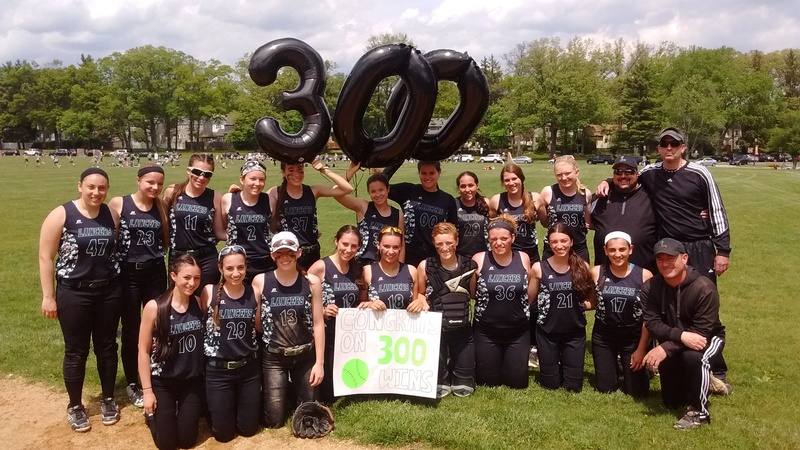 Earlier this season, Daily won his 300th game as Livingston’s head coach, when the Lancers defeated Newark Academy, 6-3, on May 14. He has been at the helm since 2001 and has guided the Lancers to three Essex County titles (2006, 2012, 2013), three state sectional crowns (2012, 2013, 2016) and back-to-back SEC titles in 2012 and 2013. From 2012 through May of 2014, Livingston was 40-1 in SEC play. 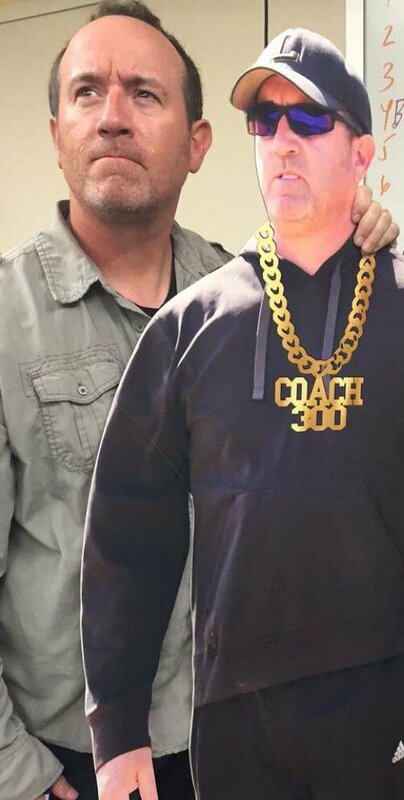 Rare shot of Jason Daily (left) without sunglasses, as he poses with a cardboard cutout of himself. (Courtesy of Emma Cooney). Some tremendous milestones were attained this year by Essex County coaches, all of which were well deserved. Bloomfield’s Bob Mayer won his 500th career game, as the Bengals defeated Memorial of West New York, 12-3, at a tournament in Clifton on April 23. Mayer, who is as highly respected as they come in Essex, began his coaching career at his alma mater in 1989. He’s guided the Bengals to success in NNJIL, Essex County and state tournament play. (Left) Bob Mayer joins his senior players on Senior Day. (Right) Mayer enjoyed win number 500 on April 23, with balloons from his players. 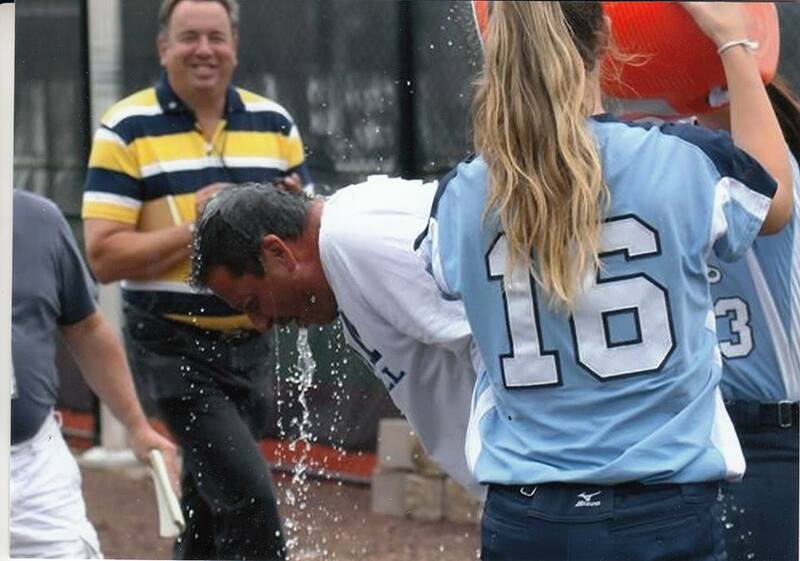 Mount St. Dominic’s Lorenzo Sozio also won his 500th career game, when the Lions defeated Bloomfield, 11-2, on May 2. A native of Bloomfield, Sozio had Mayer as a teacher, while growing up, and has held him in the highest esteem. Sozio, a husband and father of three young sons, has been the head coach at Mount St. Dominic since 1996. 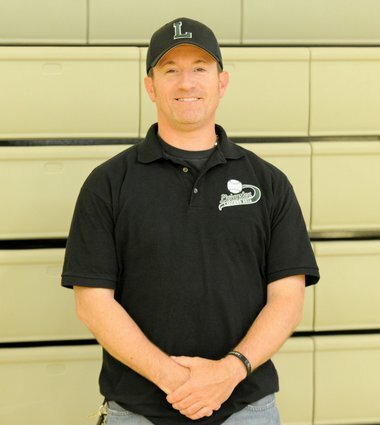 He has led the program to unparalleled success, including six county titles, eight appearances in the last 10 county finals, a Non-Public A state title in 2014 and a phenomenal record of 121-29 over the last five seasons. Sozio is also Mount St. Dominic’s athletic director and serves the school in many other capacities. As hard-working as they come, I’ve been privileged enough to see Sozio’s hard work at MSD and can say his passion and diligence speak for itself, as a coach, administrator and a good man. Luann Zullo has been the head coach at her alma mater, Nutley, since 1999, after a tremendous run as West Essex’s head coach. Zullo is the only coach in Essex County Tournament history to win championships at two different schools, having guided West Essex to crowns in 1997 and 1998 and Nutley, in 2011. 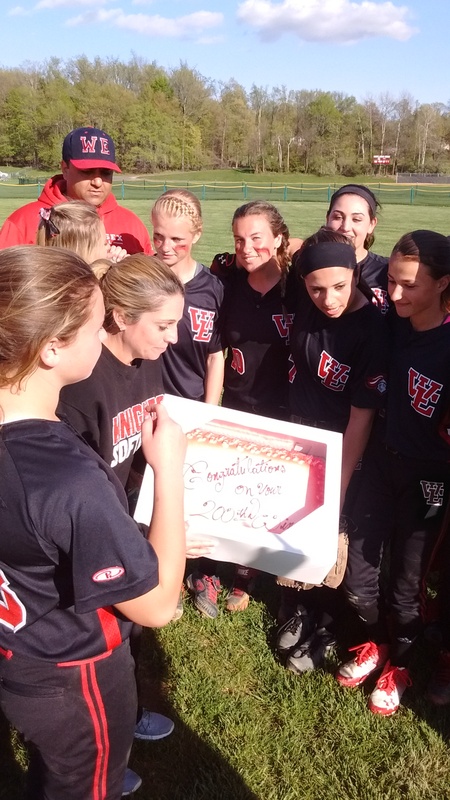 Luann Zullo won her 400th career game and was honored afterward by her team. 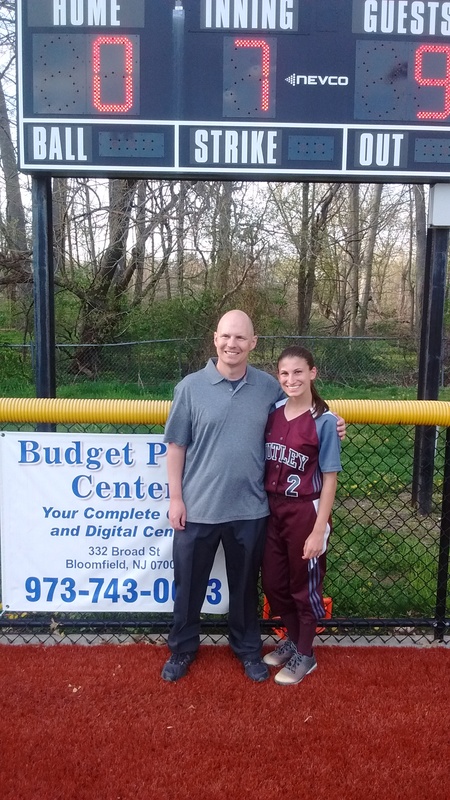 Zullo has also led Nutley to multiple state sectional titles, the most recent in 2015, and in 2010, guided the Raiders to the Group 3 title game. 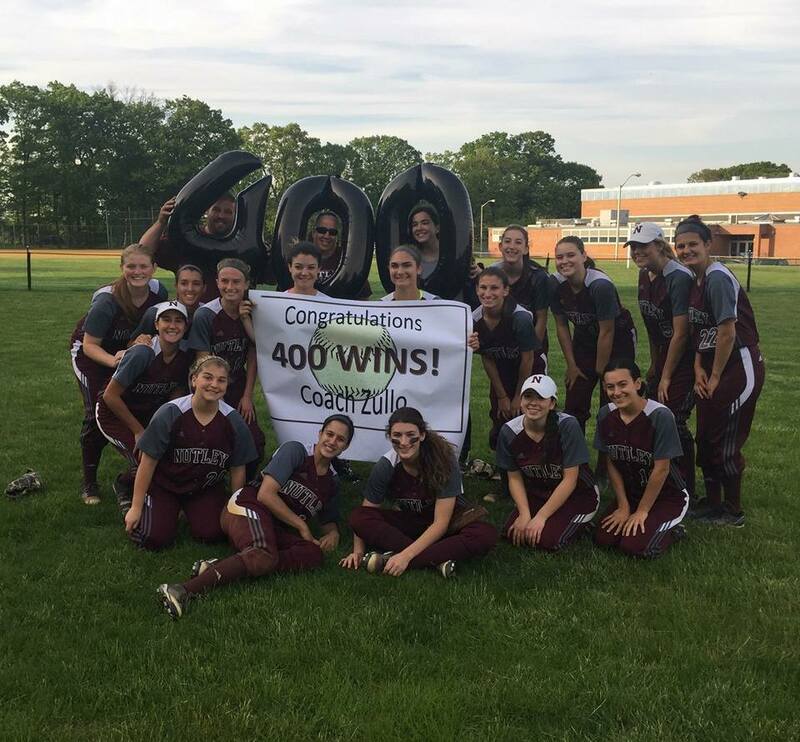 This season, Zullo won her 400th career game when Nutley defeated Sayreville, 9-4, on May 20. 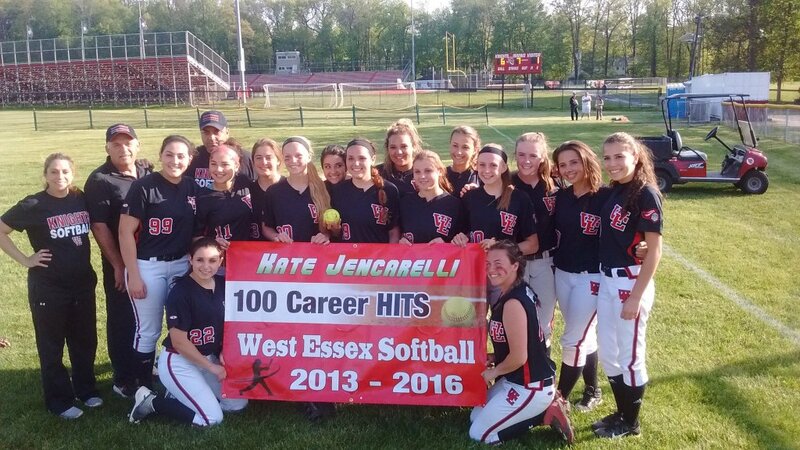 Andrea Mondadori won her 200th career game on April 27, when West Essex defeated Mount St. Dominic, 5-1, in North Caldwell. 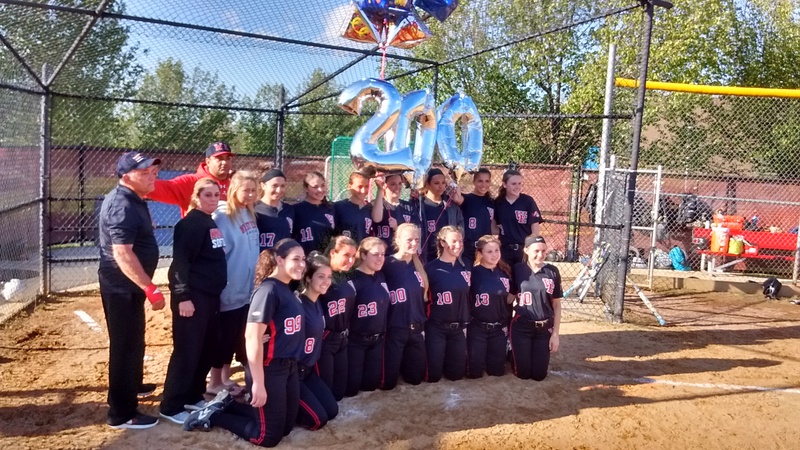 (Left: West Essex players with balloons, celebrating win number 200. Right: Bridget Betley holding a cake for Mondo’s milestone). ‘Mondo’ has been the head coach at West Essex since 2005. This year, she led the program to a second state sectional title and a second county championship, during her tenure, as well as a marvelous 26-3 overall record. 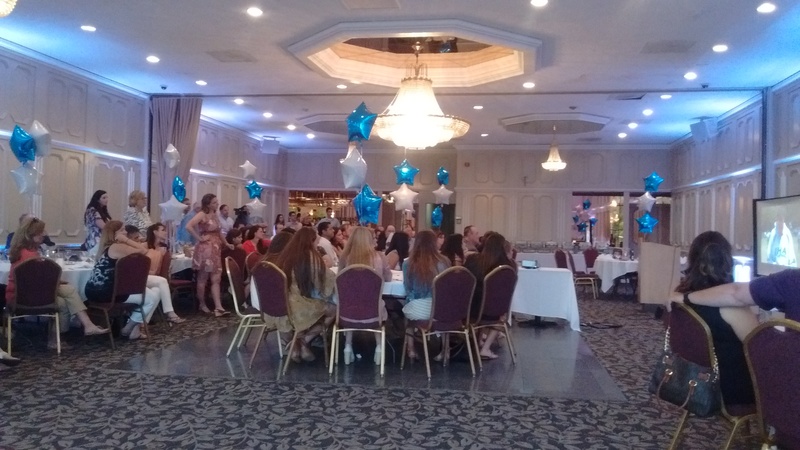 Barely 48 hours after winning a riveting Non-Public A state championship at Kean University for the second straight year, the Immaculate Heart Academy softball team gathered for its season-ending team dinner. 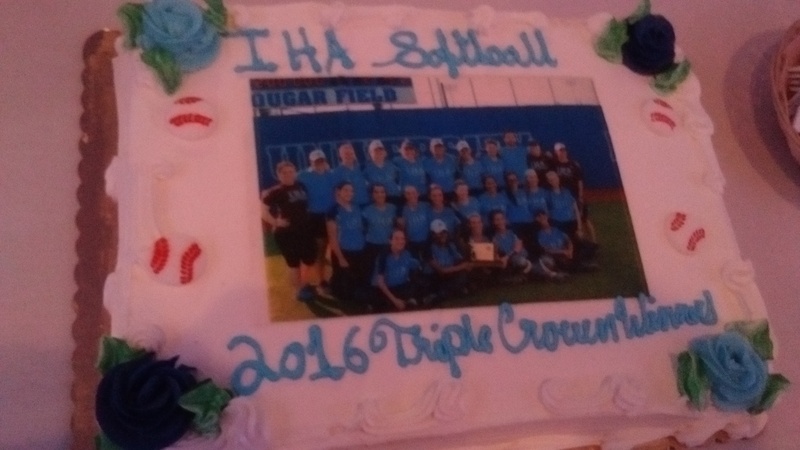 The cake, presented to the team at its June 13 dinner, was well received. (Click on all photos for larger images). The expected emotions of the event were there, but a nice mix of laughter and the joy of finishing 31-1 seemed to resonate, which would have been good news for the man that elicited the aforementioned emotions. 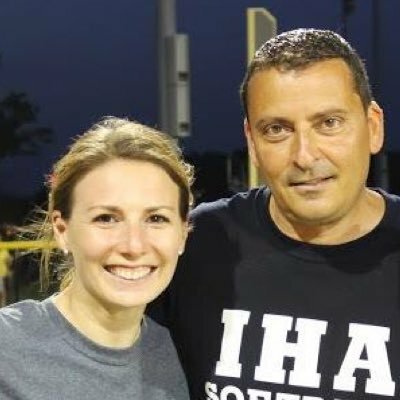 Many will say that IHA’s legendary head coach Anthony LaRezza had watched over his players all season long, as well as the parents and fans who never missed a scrimmage, or game. No one loved coaching as much as Anthony, and he knew that the 2016 season could be special after the ’15 team had won a somewhat unexpected title with a roster of underclassmen. Anthony passed away on Feb. 4, 2016, a month to the day before the official start of practice. Those who knew him best would say he never wanted the attention, that all his work was for the players. 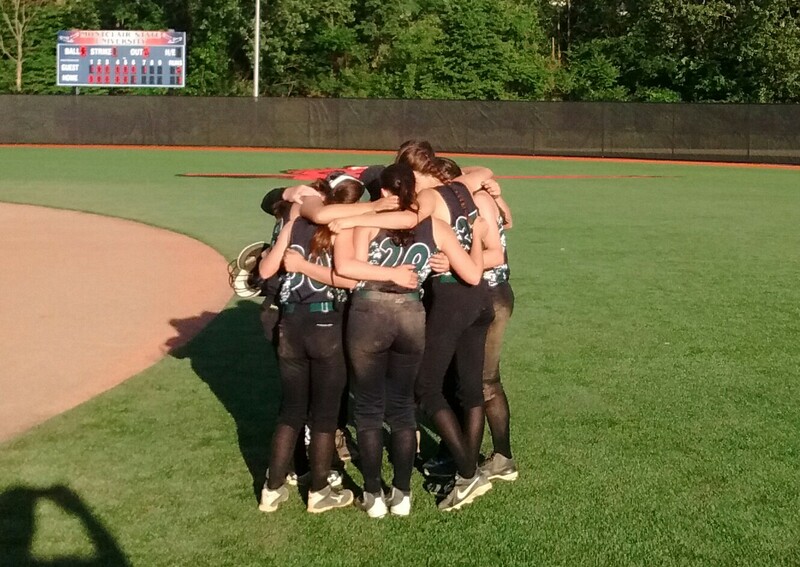 And despite losing their coach, the Eagles moved on, the way LaRezza wanted, and accomplished the ultimate goal of a triple crown in 2016, winning a conference, county and state title. Head coach Diana Fasano, who had stayed true to coaching all season long, despite a heavy heart, gave a wonderful speech at the dinner, remembering a man and a coach. Dousing the coach with the water bucket after a state title in 2015 (above) and this year (below). Fasano received the ultimate compliment from her players on June 11. 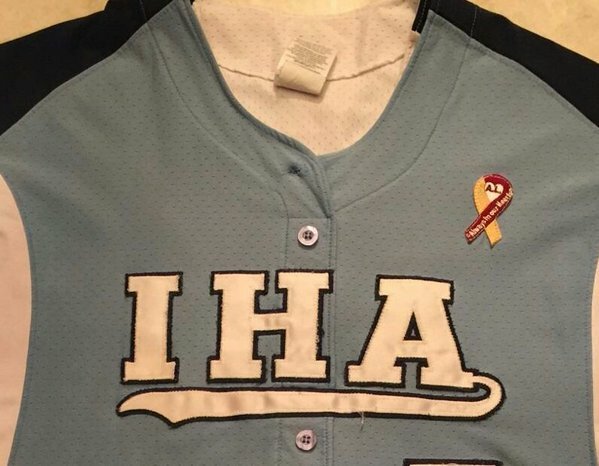 This video, put together by the IHA community, says it all about Anthony LaRezza. Assistant coach Ali Bryan, usually a very quiet person, was spectacular in talking to the large crowd. 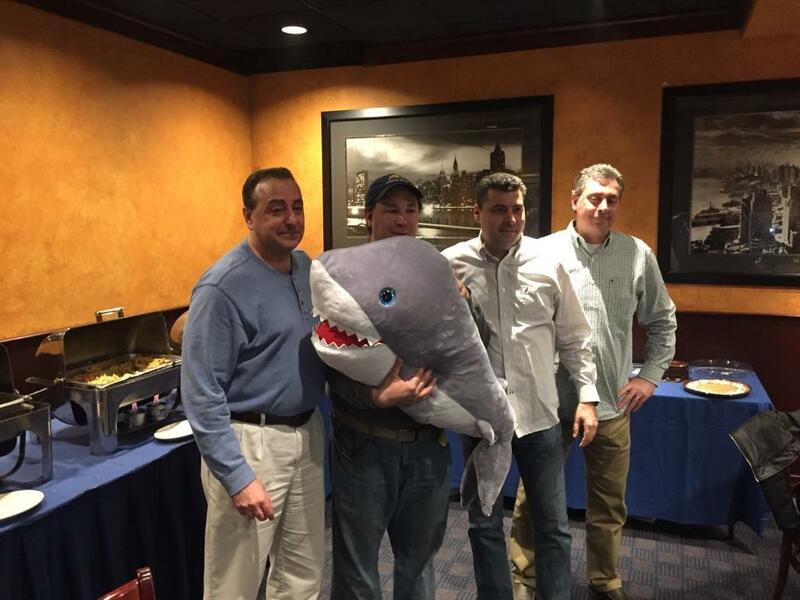 Ed Bates, IHA’s number one fan, was there, and received some nice gifts. Ed gave a nice speech, remembering Anthony and adding his pal ‘Sharky’ into the mix. The crowd laughed a lot, cried a little, and mostly smiled a great deal. 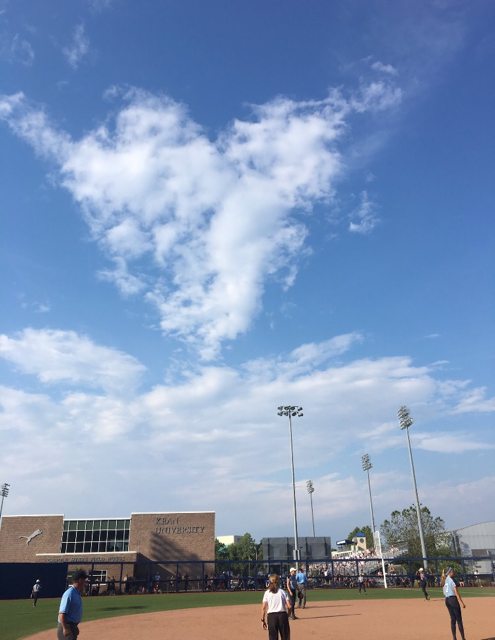 The heart-shaped cloud which momentarily drifted about the field at Kean in the top of the seventh of the championship game, was certainly a sign that Coach was close by. 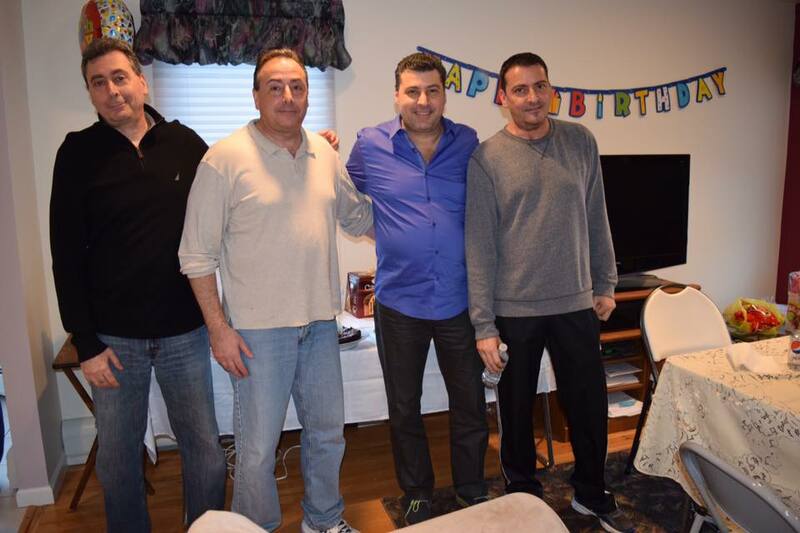 Anthony’s brothers, Joe and Allen, were also there, as they were all season long. 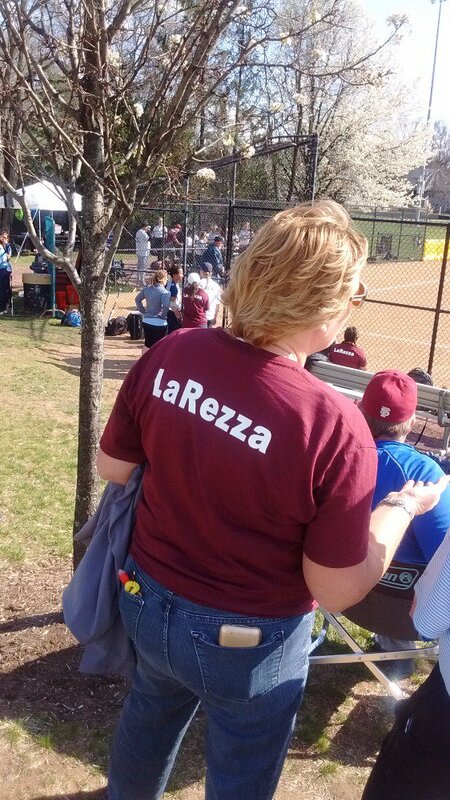 The LaRezzas presented all the players a personalized key chain, with the player’s number and name. Bates also got one, with a dolphin inscription. While handing out the goodies, Joe and Allen put on a typical LaRezza show, trying to figure out which key chain belonged to which player. The crowd laughed, and when Allen gave an impression of Anthony, when talking about what Fasano’s role in 2016 could be, it was like the Big Guy was in the room. 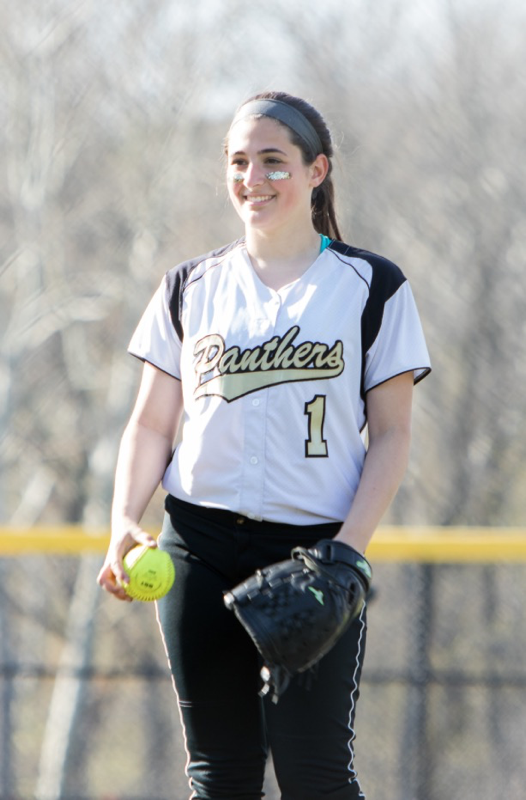 Emilie Cieslak, a senior first baseman, gave a wonderful speech, even kidding that she was ‘a little freaked out’ when first meeting Anthony’s brothers, this past March, because of the daunting resemblances, and how much the two would mean to the entire team. And when the dinner had ended, Kevin Kenerson, father of senior shortstop Taylor Kenerson, put it best. 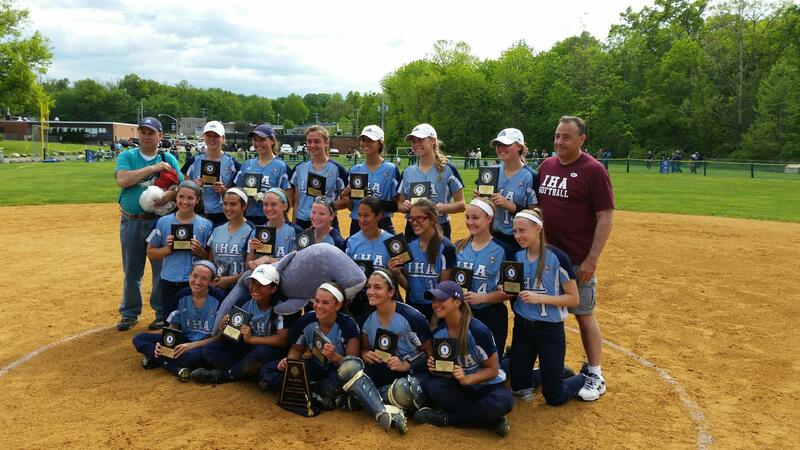 Here’s a look at the 2016 season at IHA…Please click on photos for larger images. The emotion on Reagan Jones’ face shortly after the final out was recorded in the Non-Public A state final was one of happiness, a little relief and remembering a loved one who was certainly at the game in spirit. 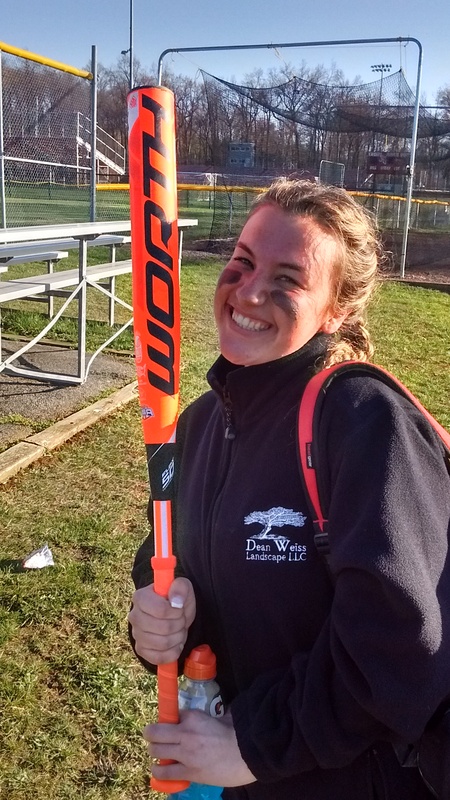 Once Jones, a junior third baseman at Immaculate Heart Academy, had a chance to reflect, she was all smiles. 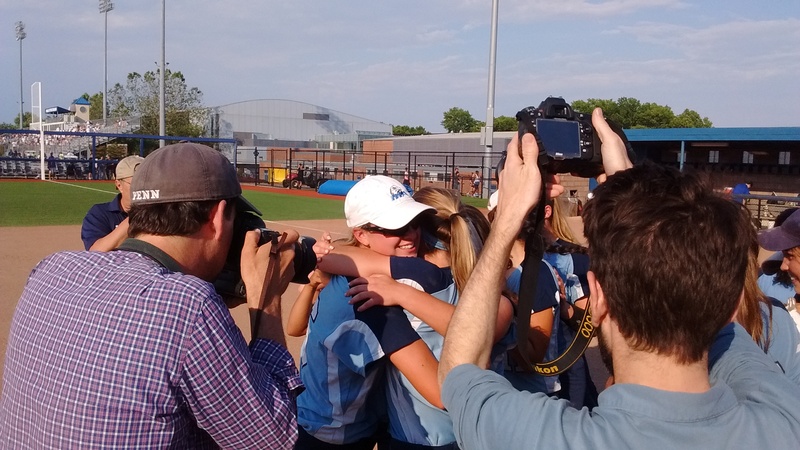 Reagan Jones and her friends celebrating a triple crown, as Reagan’s dad, Bob, in white hat, left, enjoys the moment, as well. (Click on photos for larger image). 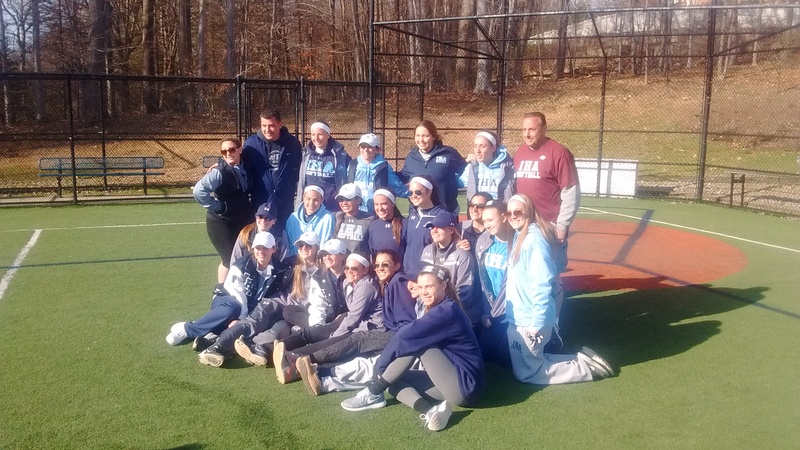 “We won the triple crown,” Jones said, referring to IHA winning the Big North, Bergen County and Non-Public A championship. 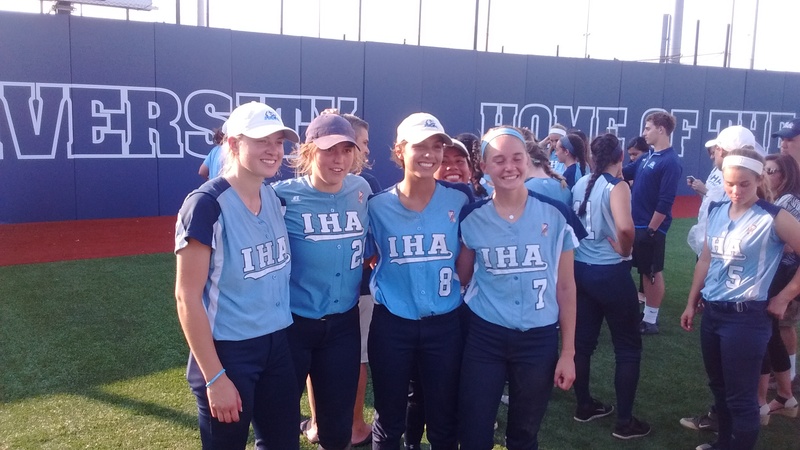 IHA had last won that trio in 2012, and also won it in 2009, both under the direction of head coach Anthony LaRezza and assistant coach Diana Fasano. This time, it was Fasano leading the way, but the late LaRezza was never far from the player’s hearts. 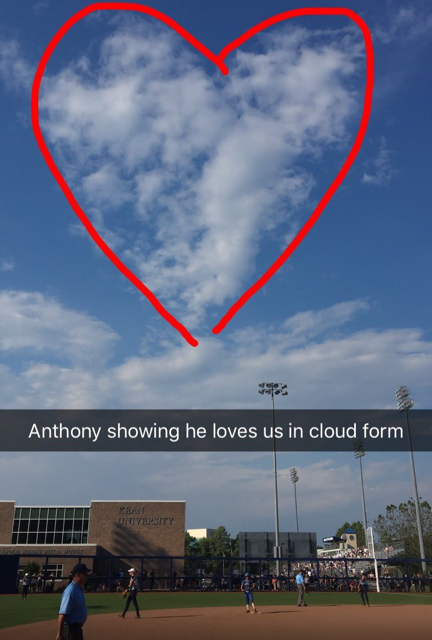 And speaking of hearts, a cloud-shaped heart in the top of the seventh, over the field at Kean University, was well captured by IHA’s trainer and categorized beautifully by a player, as you can see. 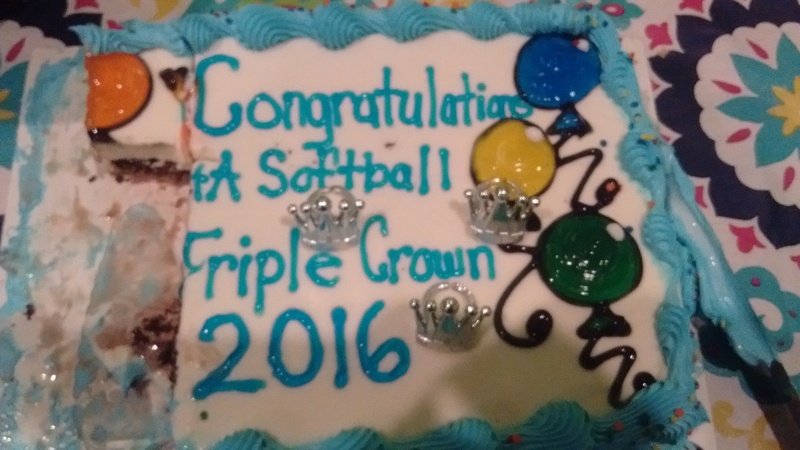 And at the post-game party for the players, parents and friends, a cake further recognized the Triple Crown that Jones and her teammates were so proud of. And Jones, at the party, looking relaxed, did admit the long season, filled with so much emotion, had finally concluded. Joe LaRezza and Allen LaRezza, the older brothers of Anthony LaRezza, were a big part of the day and enjoyed the after-party, as well. Joe LaRezza (right) is joined by Taylor Kenerson, (left), Allen LaRezza and Olivia Sprofera. 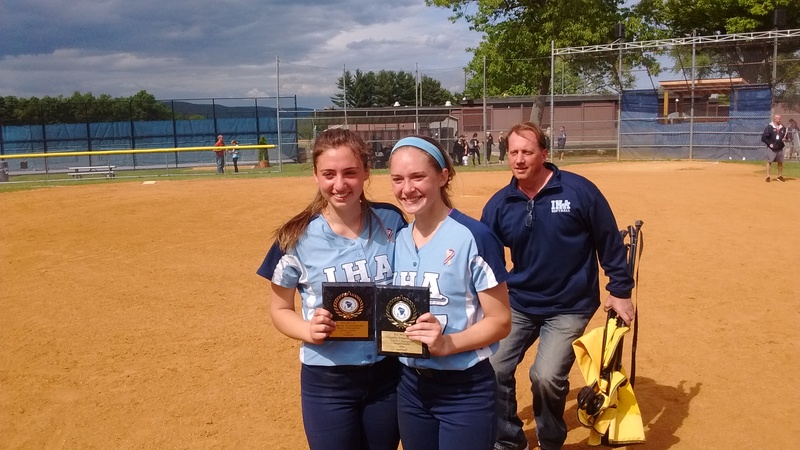 In a season of challenges, Immaculate Heart Academy overcame one more obstacle, en route to a second straight NJSIAA Non-Public A title and the presumptive nod as New Jersey’s top high school softball team in 2016. 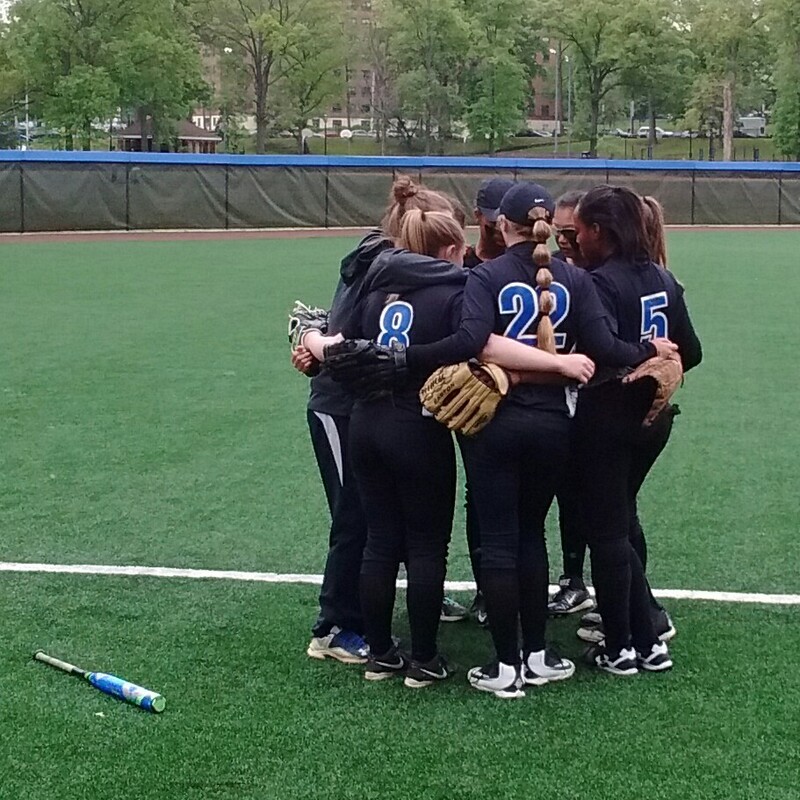 The Eagles (31-1 overall, 30-game winning streak) scored twice in the bottom of the first, then held off a very young, and talented Donovan Catholic team, 2-1, at Kean University, on June 11. 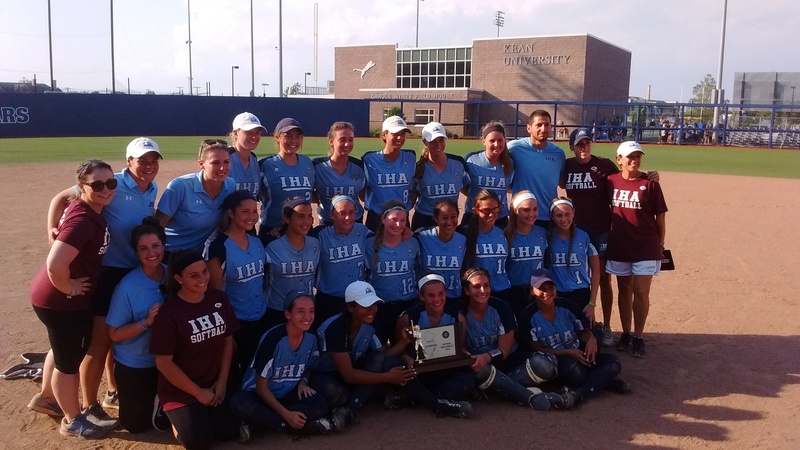 IHA won last year’s title, 1-0, when it scored the game-winning run in the bottom of the seventh inning. 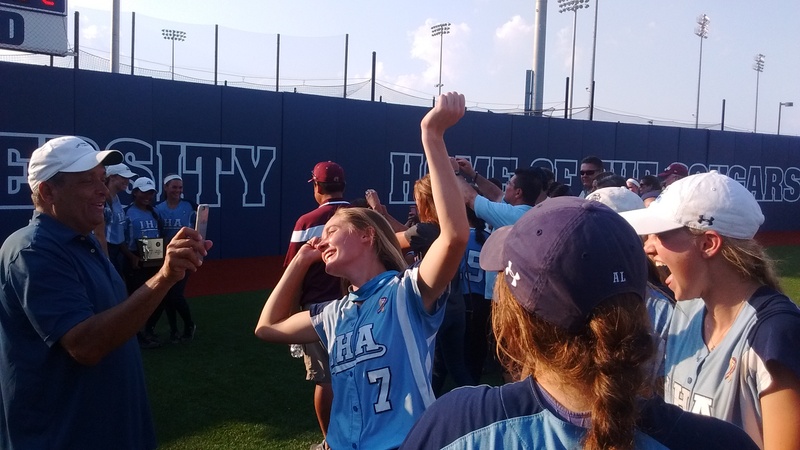 IHA players begin to celebrate, after a 2-1 win in Non-Public A final. (Click on photo for larger image). This time, it was a fast start, great pitching, once again, and a stalwart defense which propelled coach Diana Fasano’s team to a title. 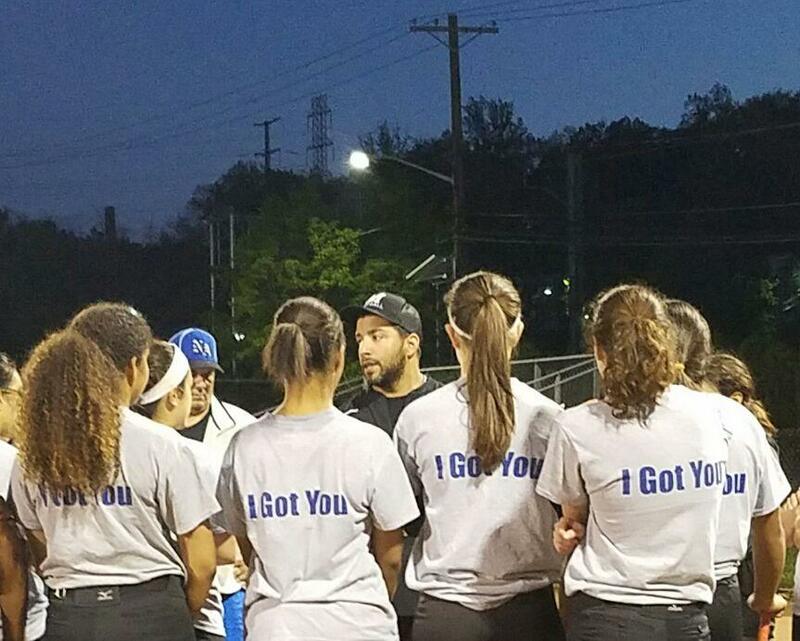 Prior to the game, Fasano brought her team together on the left field line and delivered a simple message. Fasano had juggled the responsibilities of her job well, keeping the emotion of being head coach, in check, by providing the usual discipline, hard-work and fun her predecessor, the late Anthony LaRezza, had instituted for over a decade. 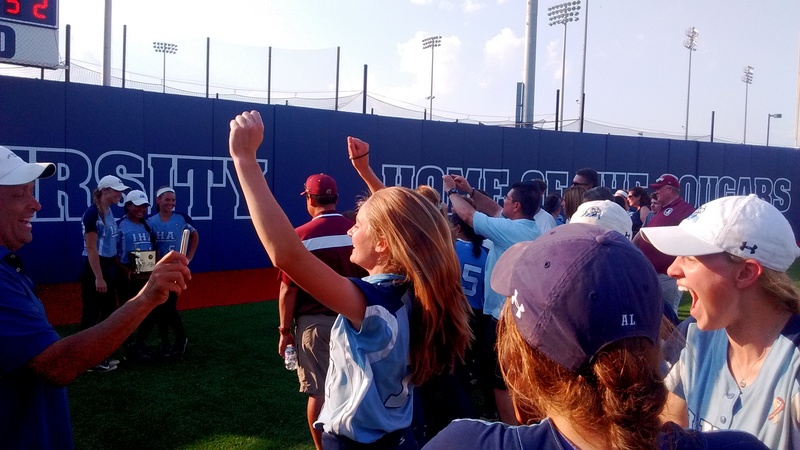 While she always made it a point about not getting too philosophical, she was somewhat wistful when asked about a possible thunderstorm interrupting her game, upon arriving at Kean U. From that first scrimmage, against Ridgefield, on March 11, to the final game, three months to the day later, it was a well-orchestrated effort of everyone associated with the program, coaches, parents, alumni, fans and the players themselves. 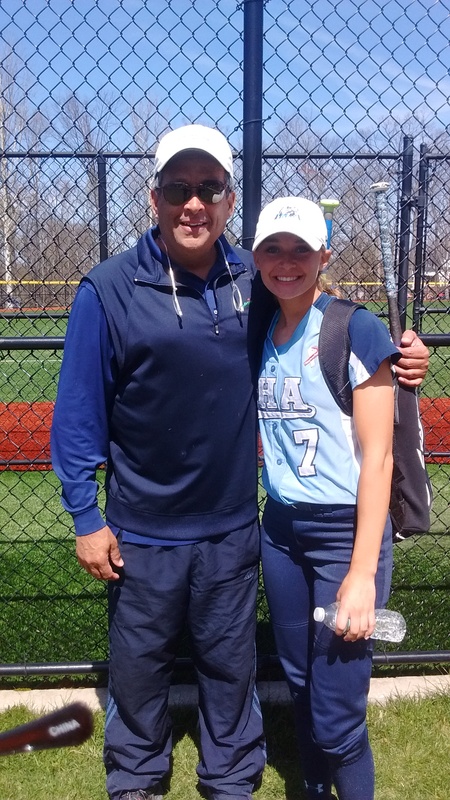 IHA scored its two runs in the title game thanks to small ball, at its best, Reese Guevarra (Sunday Silence) was hit by a pitch, then went all the way to third when Taylor Kenerson (Point Given) executed a perfect bunt. When Guevarra hustled to third, and beat the throw on a close play, Kenerson was right behind, charging into second, then throwing a distant high five to Guevarra. 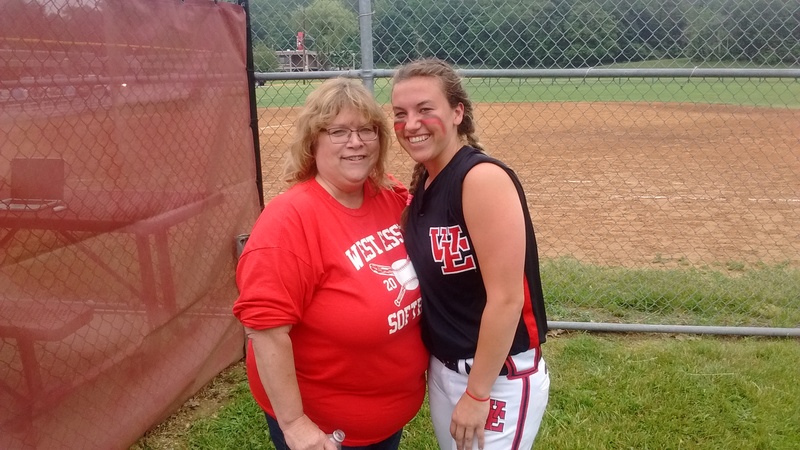 By the seventh inning, Lisa Kenerson was clutching the fence, as her daughter, Taylor, played her final high school game. (Click on photo for larger image). 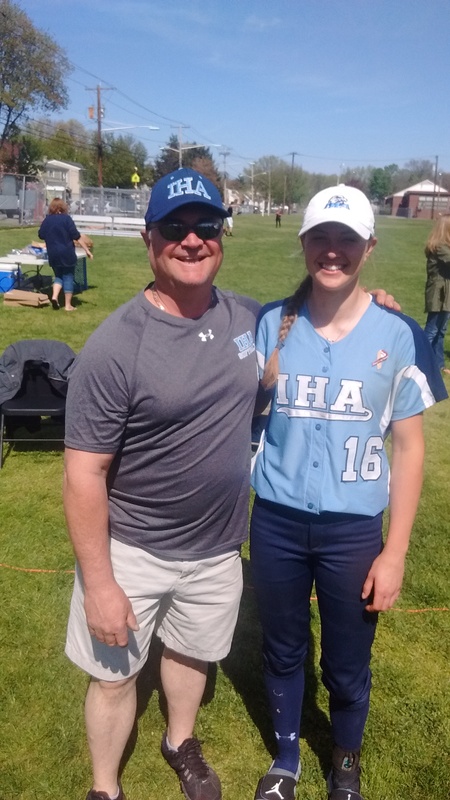 Another IHA stud, Emilie Cieslak (Tim Tam), a senior, followed with a two-run single, and it appeared that the Eagles could pull away quickly. Championship moment, (left to right) Taylor Kenerson, Emilie Cieslak, Sonia Sharma, Reese Guevarra and Reagan Jones. (Click on photo for larger image). But Donovan Catholic, which started at least five freshmen, came to play. This was the team that had eliminated South Jersey powerhouses St. John Vianney and Notre Dame, en route to the title game. And when its starting lineup was introduced, the PA announcer was either identifying a starter as a freshman, or sophomore. 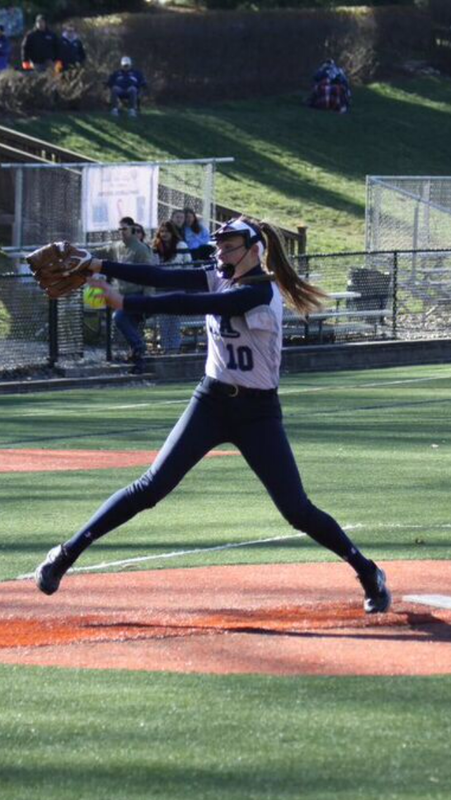 Donovan Catholic pitcher Lindsay Nelson, a freshman, was spectacular, holding IHA scoreless for the remainder of the game, and scattering four hits. But on the other side of course, was the fourth horse, Olivia Sprofera (Southpaw Seattle Slew), who was dominant early with the strikeout pitch, then worked through a few challenges in the middle innings. 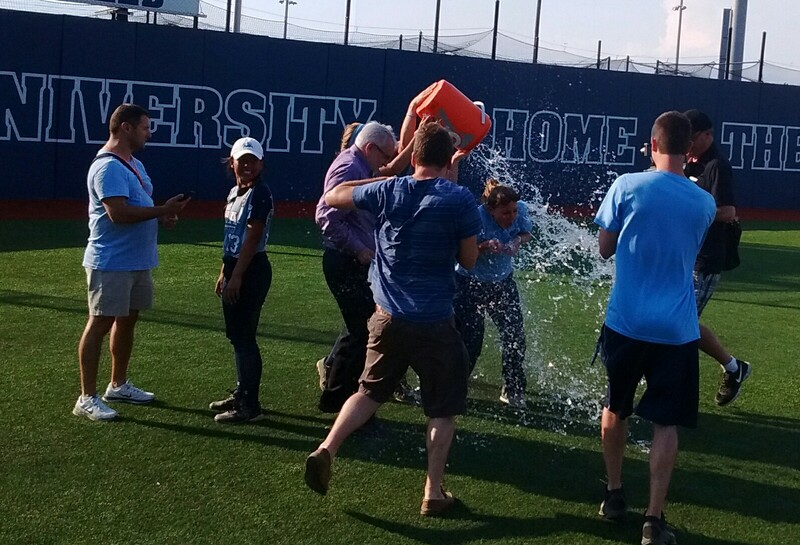 A nice water bucket shower on a hot day for coach Diana Fasano. Note how calm Reese Guevarra (left, being interviewed) is. (Click on photo for larger image). 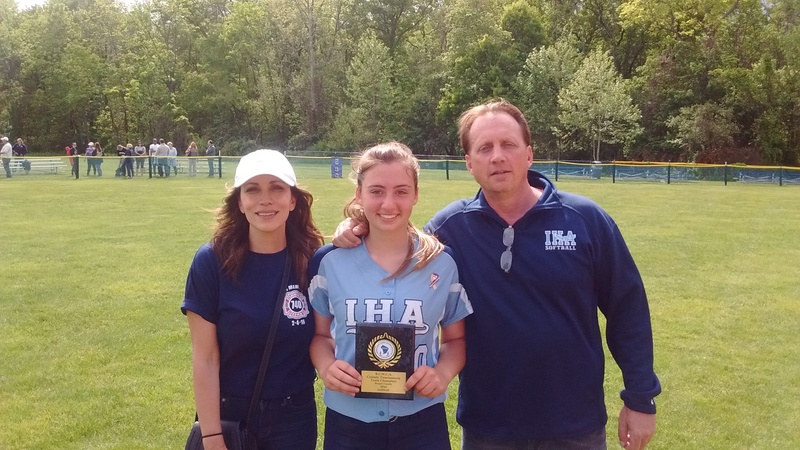 A key play was the marvelous defensive effort of Sunday Silence, when she retrieved a hard hit ball in right centerfield, with IHA leading 2-1, then threw a pea to Point Given, the cutoff at shortstop. The play was so bang-bang, that a Donovan Catholic runner was held at third, instead of trying to score the tying run. And in true Southpaw Slew fashion, two runners in scoring position were left stranded. Slew would work out of a few more jams. Tim Tam made a huge catch at first base to stop one threat, and in the seventh, after giving up a lead off double, Sprofera calmly retired the next three batters, without the runner on second going any further. Fittingly, the final out was a pop up to Kenerson, who made sure everyone around her knew that this was her ball. And that’s what makes Sprofera, a junior lefty, the great pitcher she was in 2016. Nothing flustered her. And when Fasano referred to her as a ‘horse’ during the season, she was 100 percent correct. 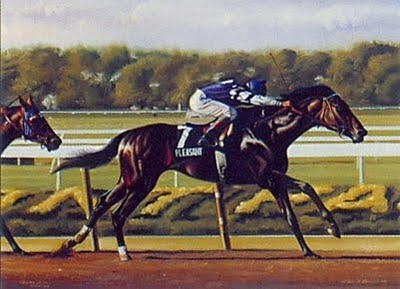 Make that a Triple Crown horse.